History of the Chevy Chase Estates Association 2nd Edition. This Second Edition of The History Chevy Chase Estates Association Inc. and the Community it Serves 1925-1987 is an online version of the original booklet. The only changes in content to the printed version of first edition are the addition of new photos, links, and an afterward covering the years 1987 – 2015. As an unabridged work of intrinsic historical value, this volume pays tribute to its author, Jerry McKee, as well as the contributions made by all members of the Chevy Chase Estates Association over the years. 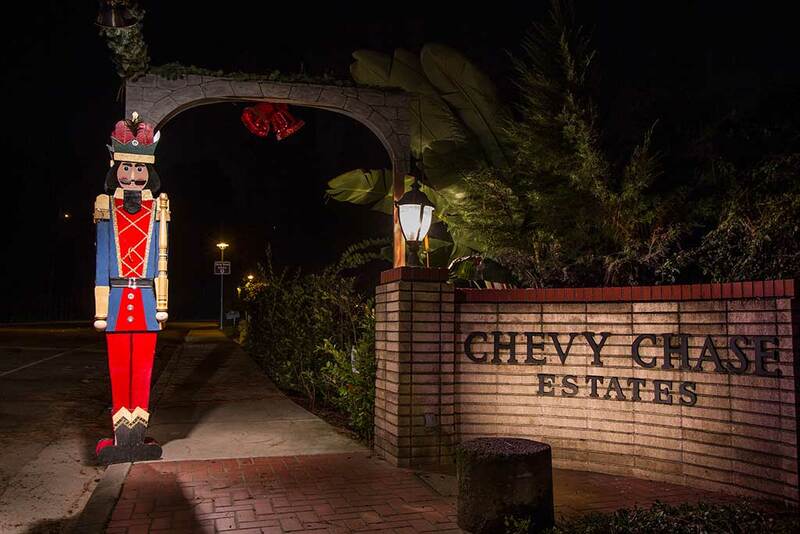 This is a telling not only of Glendale’s Chevy Chase Canyon history; it represents one chapter in the story of volunteer homeowners associations across the state of California. This second edition was compiled by Graeme Whifler, Michael Rosenfeld, Mary Jamora, and Greg Crawford. This book was compiled by Jerry McKeeand is adapted from the 1964 book of the same title, supplemented with information gleaned from the Association minutes and from newspaper clippings collected and maintained by Mrs. Sylvia Moody. The Board of Directors of the Chevy Chase Estates Association, Incorporated would like to express its gratitude to Mr. McKee for collecting, editing, and finalizing this book. Without him and his constant interest in canyon events, a piece of history would undoubtedly have gone unrecorded. For the past 50 years the Chevy Chase Estates Association has served as guardian, environmentalist and benefactor to the canyon most of us call home. The Association’s activities have varied over the years intensifying with confrontation and slipping into relative obscurity in times of inactivity. Not every issue on which the Association has taken a stance has been resolved to everyone’s satisfaction. However, each and every one of these issues has been reviewed and given due consideration by the Association’s Board of Directors, a group of individuals whose collective interest is to maintain both the quality of life and the property values within Chevy Chase Canyon. As the Association celebrates its Golden Anniversary, ‘progress’ continues to change the appearance of the once virgin hillsides that envelop the canyon. Two major housing projects are in the initial stages of development on the west side, while another nears completion on the east. Several sizable parcels remain undeveloped, awaiting preservation, residential development, or other improved usage. 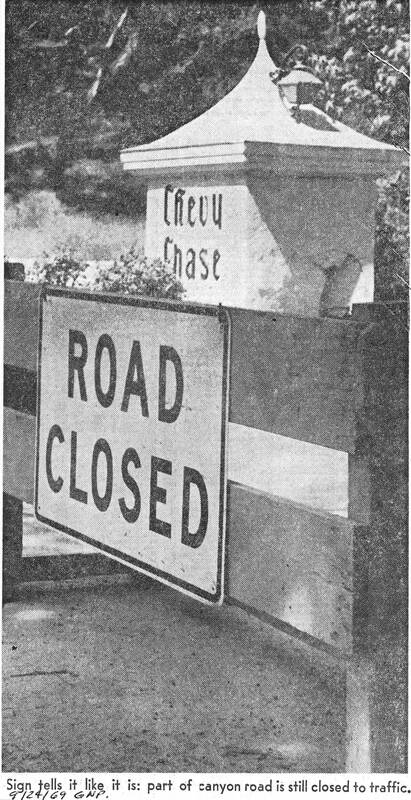 The need for property owners and residents to maintain a vigil over the issues and events affecting Chevy Chase Canyon is as great today as it was when subdivision threatened the golf club property over 50 years ago the event that directly led to the formation of the Chevy Chase Estates Association. I want to personally thank all those who have dedicated their time and money to the support and defense of the canyon. As property owners, we have all benefited from the actions of those who “took an interest” in the past. I can only hope that current and future property owners will continue to take an interest and thereby benefit both themselves and those who will follow. 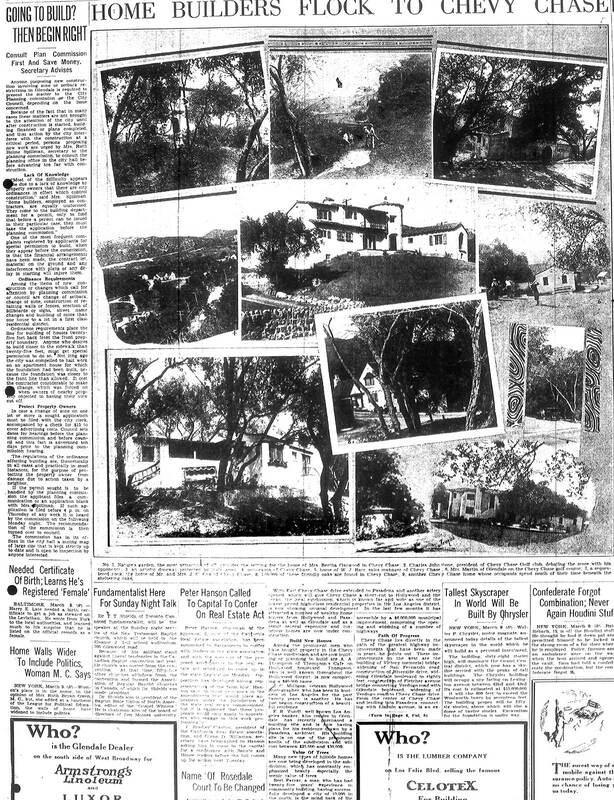 This is a history of a beautiful cleft in the San Rafael Hills, a valley that the early Spaniards called Sicomoro Canyon and that the first developers called Chevy Chase Estates. And it is a history of an organization – Chevy Chase Estates Association – that was formed to defend the wild character of the canyon, the ‘country within a city’ atmosphere that still lures people to become settlers in the San Rafael hills and valleys. It must also be the history of the focal point of the first Chevy Chase Estates development and subsequently of all of the canyon – the golf club and golf course. 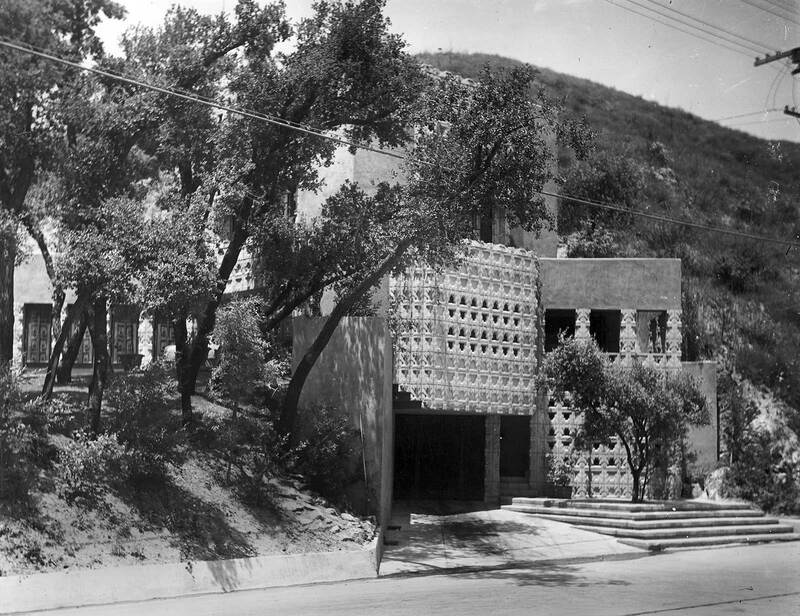 Finally, it is a history of those battles fought with developers who want to encroach upon the serenity of the canyon with condominiums and commercial centers. 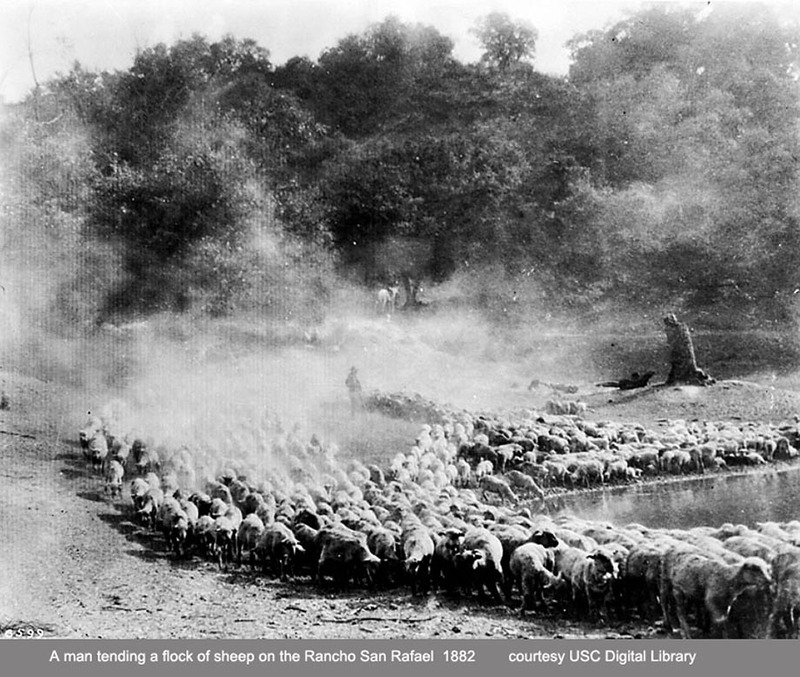 For those who have just arrived in Chevy Chase Canyon as well as those already settled in the shadows of the San Rafael Hills, this history provides a background to the canyon’s rich heritage. In 1915, only a leaf-strewn lane penetrated Sicomoro Canyon, meandering among the oaks and sycamores that covered the valley floor. 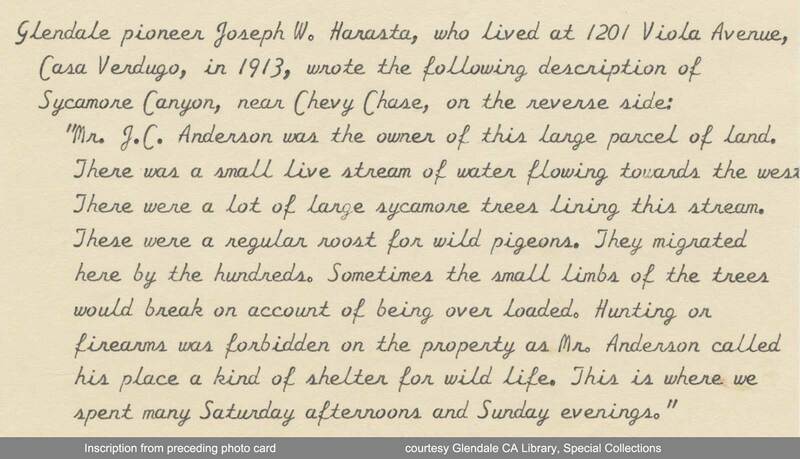 Before 1925, Chevy Chase Canyon – then known as Sicomoro or Sycamore Canyon – was a scenic hollow where only wildlife lived and where green oaks and sycamores arched over native flowers. The lush grasslands were a haven for deer and bears, and raccoons and beavers made use of the streams. 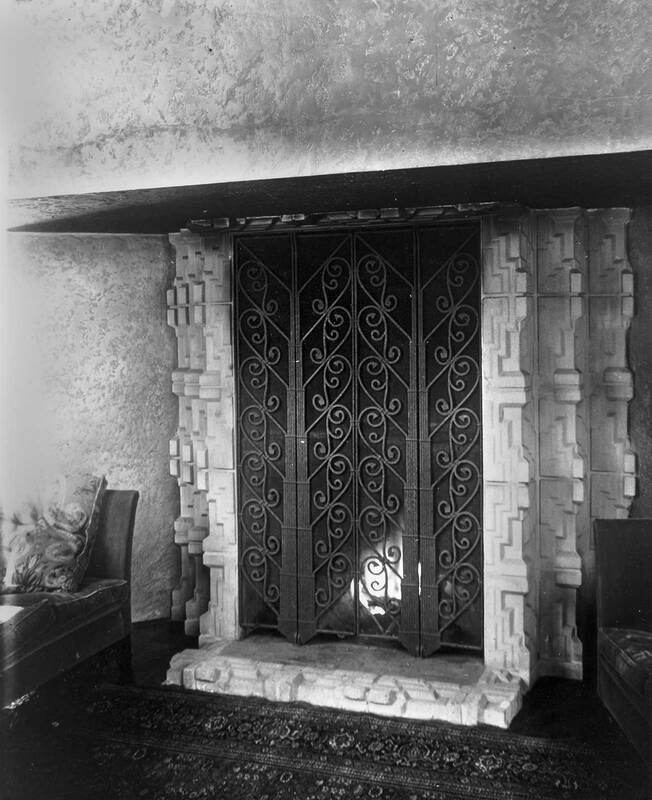 For a while, The canyon was a private game preserve for the wealthy Doheny family, and locked gates once barred entry to the canyon, near the point where the lighted portals now welcome residents and visitors. Then a man named Bert Farrar began to develop a rustic community in the canyon – Chevy Chase Estates – that blended homes with nature in a parklike setting. Focus of the area was a golf course and clubhouse. Over 30 miles of nature trails wove through the sycamore and oak trees. Chevy Chase Estates was, from the start, a beautiful and unique community because of its location in natural wooded hills and canyons. A new road in the canyon, Chevy Chase Drive, ambled across the valley floor, with the natural scenery augmented with colorful flowers and shrubs (planted by the developer and cared for by a year-round gardener). This all provided an atmosphere of exclusiveness and prestige. 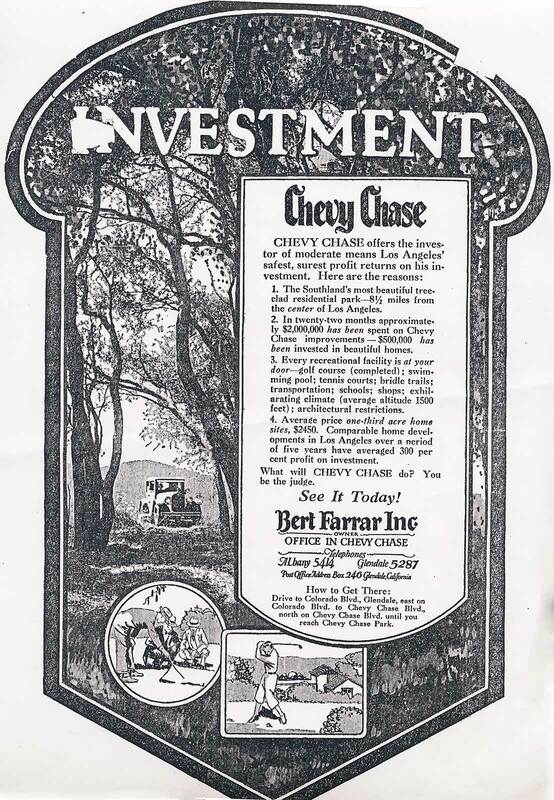 Within two years Bert Farrar Inc. had invested over $2,000,000 (in 1927 dollars!) in the area. He offered ‘large beautiful homesites overlooking the golf course’ for $1750 up, although the average cost of the one third acre estates was $2450. Times were good. The future of this high class residential development looked very promising, and sales were impressive. Construction of attractive an and generous sized homes moved ahead, each individually designed and planned to suit the owner, with each home adapted to its location and the terrain surrounding it. There was neither grading nor bulldozing then! 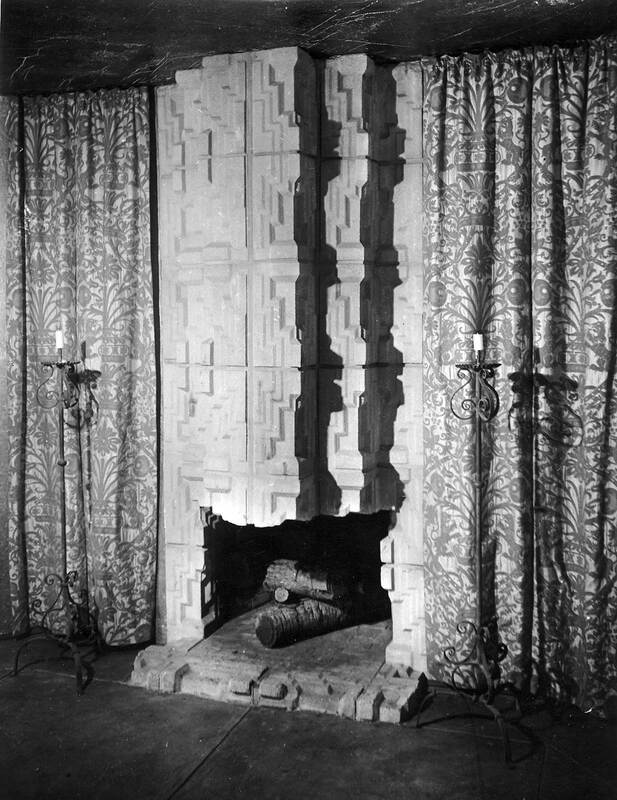 The first home completed beyond the gates of the new Chevy Chase community was the English Tudor home at 2500 East Chevy Chase Drive. 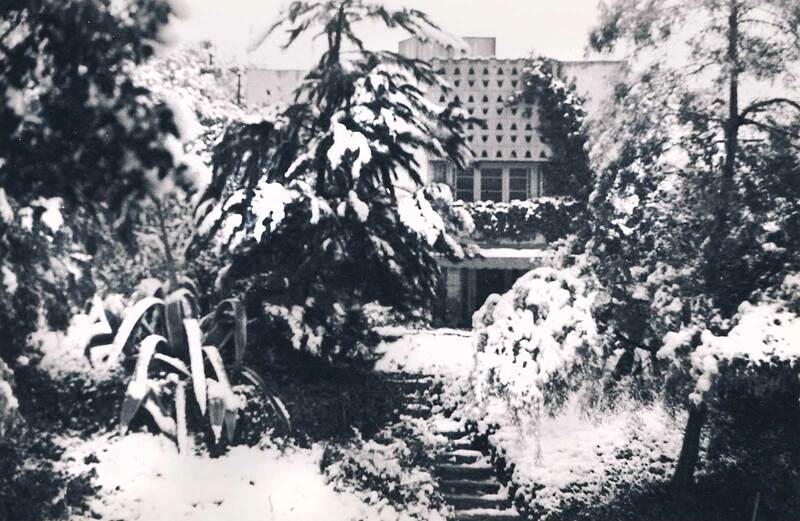 Numerous Spanish Colonial houses graced the canyon, including the famed ‘castle’ at 2322 East Chevy Chase Drive and the home at 2380 St. Andrews – the original residence of Bert Farrar. 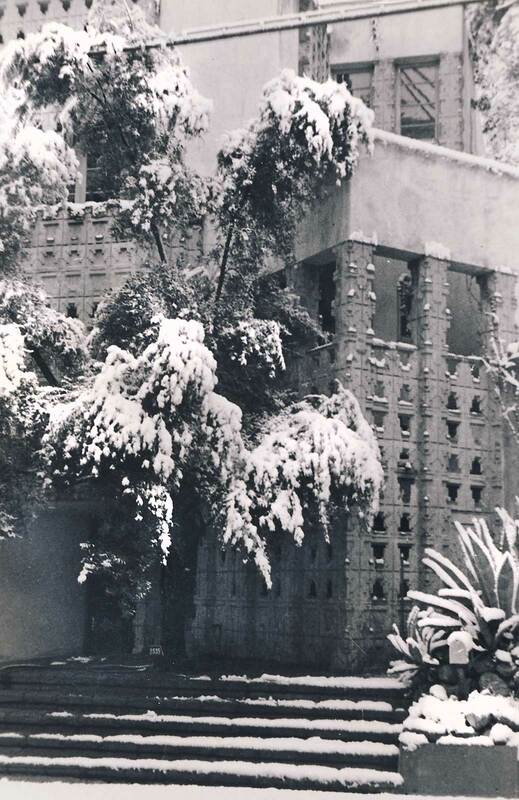 The canyon also has several houses designed by Lloyd Wright, renown son of the distinguished Frank Lloyd Wright. The most noted of these is the ‘Derby House,’ built in 1926 at 2535 East Chevy Chase Drive. Others are the ‘Calori House’ at 3021 East Chevy Chase Drive and the ‘Lewis House’ at 2948 Graceland Way. The developer had written into the deeds that all building plans must be submitted to, and approved by an Architectural Board appointed by the developer. No dwelling costing less than $5,000 – a moderately high minimum at the time – was permitted in the tract. With the purchase of property, the owner was presented with an application for membership in the Golf Club. 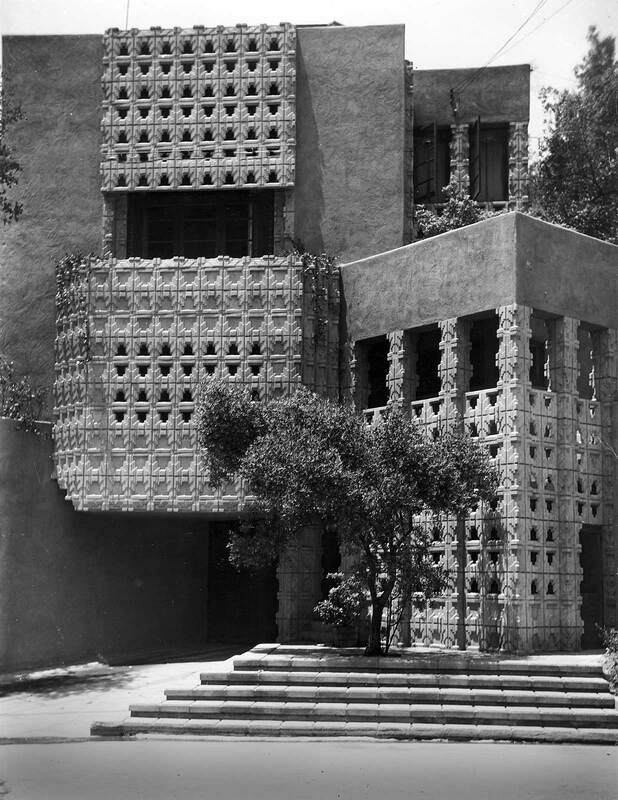 The development thrived, and by 1929 there were nearly 60 homes built in the canyon. Public transportation into the canyon was provided hourly by the Glendale City Bus Company. In addition, residents could hail the Biltmore bus that regularly ran between the Los Angeles Biltmore and the Flintridge Biltmore – now the Flintridge Sacred Heart Academy. But the stock market crash and the subsequent depression brought a halt to further development, and ultimately ended Bert Farrar’s interest. By foreclosure, Security First National Bank of Los Angeles fell heir to the Golf Club and all of the unsold properties. Many people had all of their savings invested in their homes, and could only hope for a return to prosperity. But the Bank was skeptical, viewed their Chevy Chase holdings with pessimism, and became impatient for some dollar return on their investment. The Golf Club continued in operation, but as a public course under the management of the bank. The depression dragged on . . In the summer of 1937, the News-Press carried the startling headline announcing that the Golf Club was to be subdivided by the bank that now owned the property. Three residents who lived closest to the club house went to City Hall, inspected the plans, and saw that the planned development was of poor quality, to be cheaply constructed. They requested that the City delay action to give the people of Chevy Chase an opportunity to express their views about this proposed subdivision. The delay was granted. 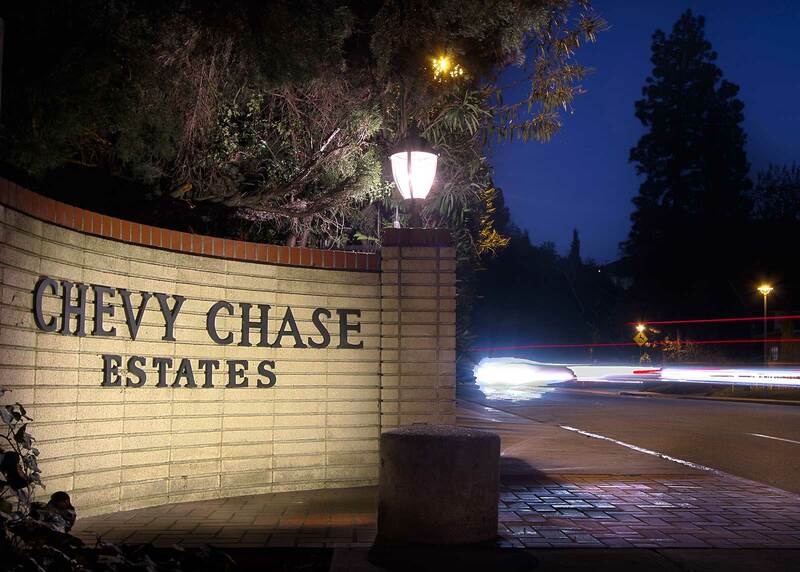 A volunteer committee of eight men held several meetings and formed one of the first ‘homeowners’ groups in California – the Chevy Chase Estates Association (CCEA). A constitution and bylaws were adopted, and the members began soliciting signatures on petitions among the residents of all 68 homes that had been built in the canyon. With 100% of the residents signing the petition, Association members went en masse to City Hall. Their objections were based on the lack of sewers in the canyon. Impressed with the new Association’s petitions and arguments, the City Planning Commission rejected the bank’s plans. But by 1938, with W.P.A. funds and labor, a sewer line was extended up Chevy Chase Drive to the Golf Club. As the Association anticipated, the bank came back with more subdivision plans, little better than the previous ones. Once again canyon residents gathered forces and met with the bank’s representatives at City Hall at a Planning Commission hearing. After a stormy three hour session and heated discussion, the Planning Commission, in the face of such bitter opposition, could not make any decision – and so simply postponed indefinitely any further hearings and actions. With the approval of the Association members, the Directors began negotiating with the bank to obtain the golf course property. The residents were receptive to forming a corporation to obtain a yearly lease on the Golf Club with an option to buy. The price they offered (on April 28, 1938) was $40,000. This bid was not accepted, for the Association was outbid by a prominent Los Angeles social club. However, that club later withdrew their bid, and the fate of the Golf Club continued to hang in the balance. The City of Glendale was approached to purchase the property, but they backed away. An older couple (a retired professional dance team) then obtained a lease from the bank and ran the Golf Club for a short time. Several residents advanced the couple funds as an indication of their support, but this venture was short-lived. Following their unsuccessful attempt to subdivide the golf course, Security First National Bank’s next move, in the fall of 1939, was to auction off some of the lots around the perimeter of the golf course. These were very small lots, intended by the developer to be sold in combinations to suit the plans of the individual builder, and were never intended to be sold individually. Many of the lots were not large enough to accommodate dwellings of the size and type of the residences already established here. Other lots were deemed unsalable and went for tax sales, and this further lowered property values throughout the area. 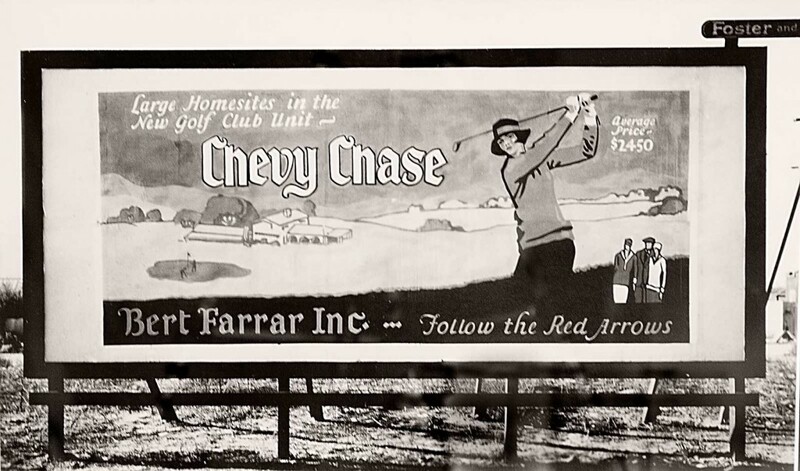 In February, 1940, the Golf Club was sold to Charlie Corbett, a former jockey, and his wife. They operated the club as a private golf course for nearly 20 years. At last someone cared enough to stay and work. Activities of the four-year-old Chevy Chase Estates Association were brought almost to a standstill by the attack on Pearl Harbor and the onset of World War II. Many long-time residents can remember the blackouts, Bundles for Britain, Civil Defense, Red Cross, and First Aid meetings. During the war, the powers-that-be decided to withdraw the subsidy of the Pacific Electric (P.E.) Bus Line which was then operating in the Chevy Chase area. The Association made every effort to keep it in operation, but it was a losing proposition. Service was reduced to two runs a day ‘for the duration’ for the benefit of school children, and after the war service was discontinued altogether. The Association then made arrangements with the Board of Education to requisition bus service for schools. At the war’s end, Chevy Chase was showing signs of neglect. Weeds grew along the streets and hung over the curbs. 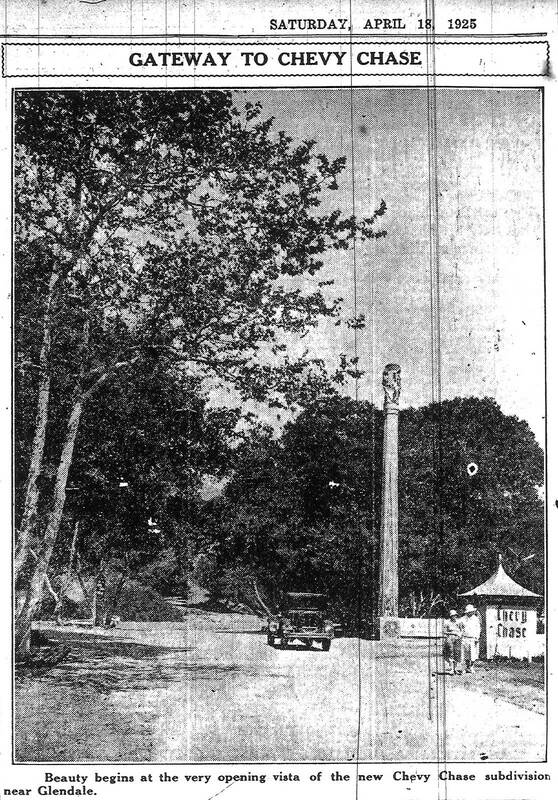 The ornamental lights at the Golf Club entrance – installed in 1926 by Bert Farrar – had been broken and disconnected. In the wake of the postwar housing shortage, construction of new homes was in evidence. 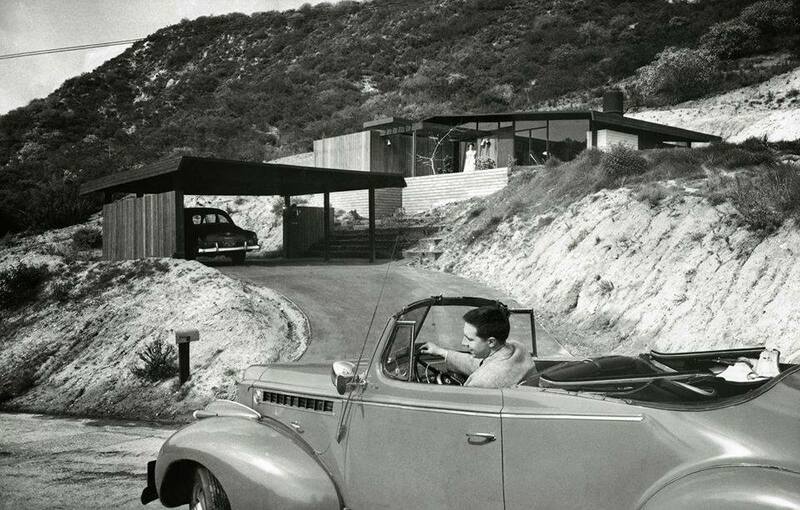 But the first postwar house completed in the canyon brought about a storm of protests from all parts of Chevy Chase. Unattractive in appearance and much smaller than average, it was entirely incompatible with the expensively built homes around it. What was more, it had been constructed under false pretenses: the builder, posing as a war veteran, got signatures from sympathetic neighbors on a petition to permit a setback variation. Too late it was discovered that the man was a speculator and not even a war veteran. Yet this single example of what could happen elsewhere in the canyon brought home the importance of the Association, which had become inactive. On June 2, 1947, residents met at Glenoaks Community Hall. Many canyon problems were aired and discussed at length. Eight Directors of the Association were elected that night. A few days later the new Board met and elected their officers and mapped out their program. About this same time the Garden Club was organized, then as an auxiliary of the Association. Directors of the Association prevailed upon the City to clean and patch up the streets. Aided by the efforts of the Garden Club, the city Park Department planted shrubs all the way along Chevy Chase Drive from the entrance to the Golf Club. The ornamental lights at the entrance to the club were repaired and lighted again. 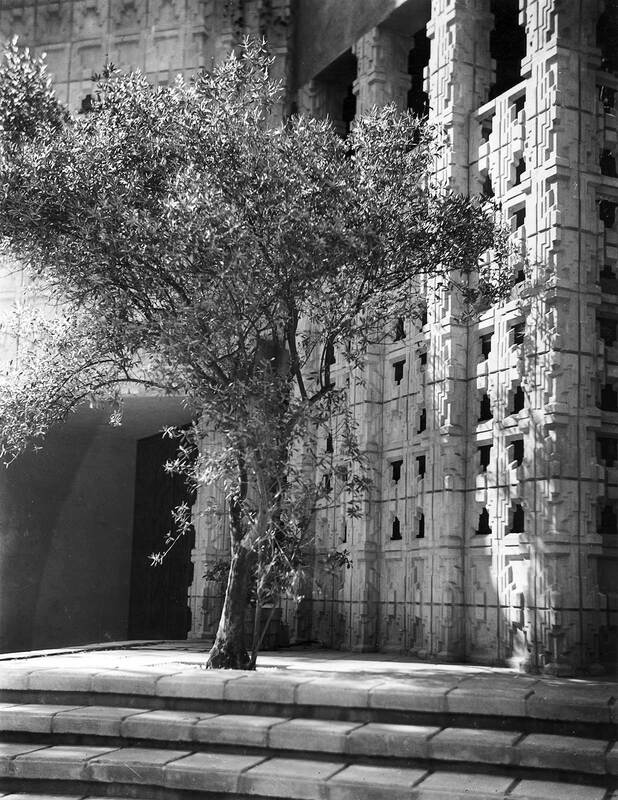 Unsupervised haphazard grading and excavation, which had become standard in the frenzy of postwar reconstruction, was brought under control by ordinances which this Association initiated and the City adopted. An abandoned army barrack on Buckingham Road was removed after persistent requests from the Association. 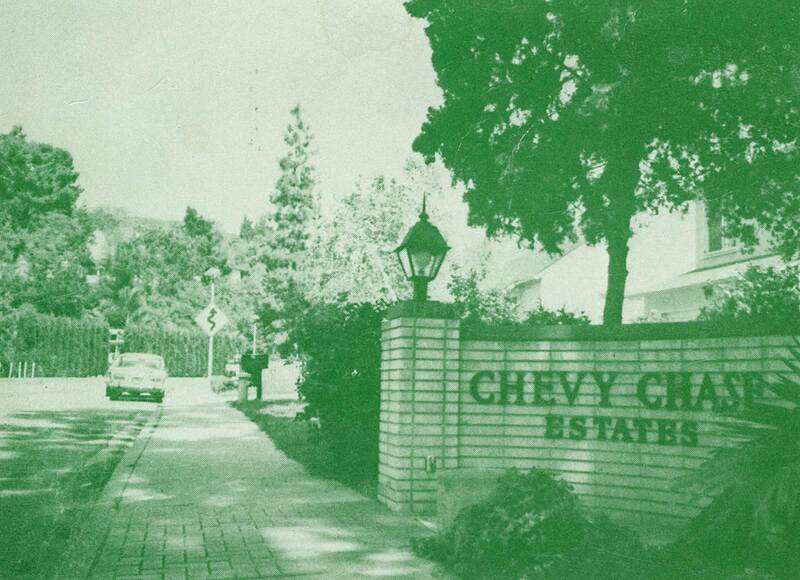 In April, 1948, the Chevy Chase Estates Association was incorporated as a nonprofit corporation of the State of California. In the same year the CCEA Architectural Advisory Committee was reactivated. With mostly bluff, these men took it upon themselves to request that all prospective builders presented their plans and applications for setback variances to the Committee for review and recommendation to the City Planning Commission. It worked. The City Planning Commission, probably surprised at first, agreed that this committee would prove helpful to them. The major handicap that faced the CCEA was the lack of adequate building restrictions. The early requirement that a house must cost at least $5000 was little or no protection, because of the spiraling cost of postwar construction. Restrictions imposing a minimum square footage for new homes was imperative if residents were to retain the value of their investments. But it was a long uphill battle to attain such restrictions. CCEA Directors spent six or seven years talking among themselves, with other residents, and with City officials, trying to convince them that special zoning restrictions were legal and had been upheld as valid in other cities. With the signatures of 98% of the Chevy Chase homeowners, the Directors of CCEA petitioned the City Planning Commission and City Council to adopt our proposed ‘R1R’ (restricted single-family residence) zoning ordinance. The major opposition against adoption came from three people who owned acreage on the higher slopes – but their arguments proved unconvincing, and in May 1956 the long-sought restrictions were adopted by City Council. The minimum square footage for homes in Chevy Chase Canyon was established at 1400 square feet of livable space, excluding porches, patios, and garages or carports. This figure was based on the average of measurements of all homes build in the area. While the square footage of the original prewar homes was far greater than this figure, the average had been reduced by the many small homes built in the postwar years while the ordinance was being debated. During this struggle for restrictions, a developer asked for a special code variance so that he could build a group of eight or nine houses around the perimeter of a 20 foot culdesac overlooking the golf course. With a crowd of Chevy Chase residents at the City Council hearing armed with petitions opposing this variance, the proposal was rejected. As a result, one fine home now stands where nine tiny houses might have stood, had CCEA not taken steps in opposition. The ‘small lot’ problem came up repeatedly during the period of postwar growth. The showdown came when that builder who had posed as the war veteran came back with plans to build another substandard dwelling on the lot next to his first structure. To do this, he needed setback variances on two frontages. The CCEA Board of Directors and the Architectural Advisory Committee refused to recommend the variances. Instead, they proposed that he sell his lot to the people who had purchased his first house and wanted to enlarge it but needed the additional lot to do so. He wasn’t interested because he wanted more money than was offered, even though the Directors thought the price fair. It was the Association’s conviction that another small house like the first one would both bring our property values to a new low and would set a standard for future similar structures. The builder applied directly to the City Planning Commission for variances, but when presented with Association petitions, the Commission denied him permission to build on the small lot. He then accepted the Association’s original suggestion and sold the lot to be combined with the adjacent improved property. But as fate would have it, illness and death prevented the people owning that property from enlarging their house as planned and the combined properties were sold. It changed hands several times, with each buyer attempting to separate the property into two parcels with the expectation of building another house on the second lot. But this could only be done with setback variances, which the Association consistently opposed. Finally, an architect convinced the CCEA Directors and the Committee that an attractive two story house could be designed to fit the lot and not be objectionable to the surrounding homes. The Association agreed, having successfully fended off all other plans until the right builder came along with plans compatible with canyon quality. In July, 1950, a firm in Calgary, Canada proposed to build 1,000 low-rental apartment units in the upper Linda Vista area. This was, of course, firmly rejected – but it was the harbinger of things to come! In 1951, an old dilapidated abandoned real estate office stood on the triangular lot at the intersection of Chevy Chase and Linda Vista. No one knew for sure when it was built or by whom. Sometimes it appeared occupied, although there were no kitchen facilities and only a small washroom. That obscure abandoned building led to a major row. There were complaints about the rundown structure, but nothing much was done – until the rumors began to circulate that it was to be sold as a residence. The Association opposed the sale on the grounds that the structure was not habitable and that it obstructed motorists’ view. The Chevy Chase Estates Association petitioned the City Council to condemn the building and have it removed. A hearing, well attended by canyon residents, was held to discuss the matter. It was known that, for some reason, two Councilmen did not approve of the condemnation. Just before the meeting, a City official was overhead to remark that ‘Anytime Chevy Chase wants anything, they pack the house and I’m tired of being pushed around.’ This infuriated the CCEA President, who told the hearing (in what the minutes reflect as a ‘generous lecture’) that CCEA did not want to be on the offensive every time it appeared before city planners, and that the canyon residents only wanted ‘good sound horse sense’ in the development of hillside property in the area. When another City official brought out that a permit for the construction of the real estate office could not be found, the CCEA President countered, “If a structure is put up illegally, the authorities have the power to order its removal.” In due time the real estate office was condemned and a lawn planted. Fearful of losing the good rapport established with the city over the matter of the shack, the Association invited the Mayor and City Councilmen to meet with all CCEA members at the Chevy Chase Country Club to talk about vital canyon problems, and all accepted. Later it was decided that the City policy-making officials and department heads should meet periodically with the CCEA Directors and Committee members for a quiet dinner at the Country Club for the purpose of gaining a better understanding of each other’s problems. 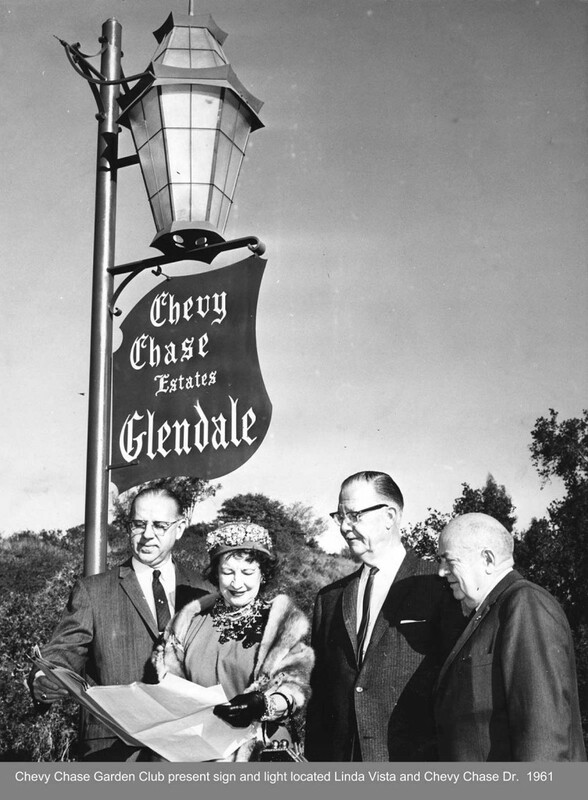 The Chevy Chase Estates Association has always sought to maintain friendly relationships and close rapport with the leaders of the City of Glendale. 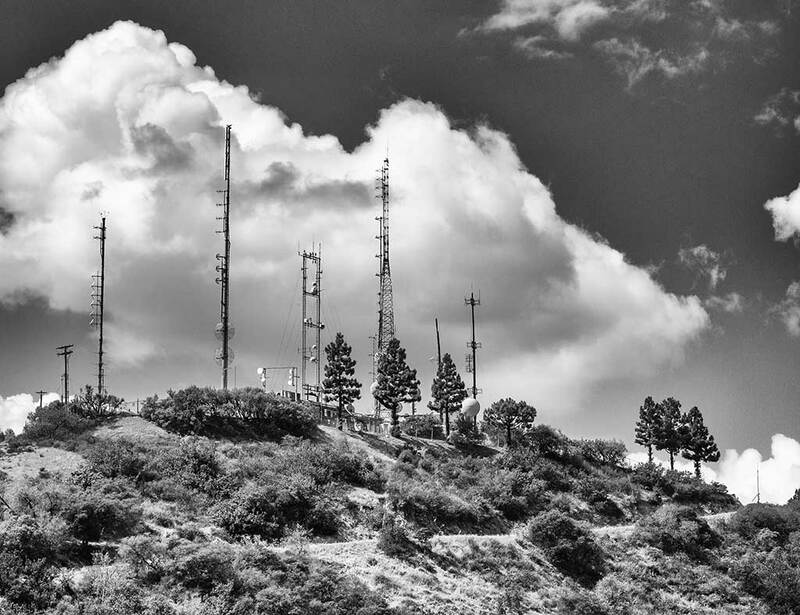 Consistent efforts had been made to increase the density and height of the commercial radio towers in our hills, and particularly on Mt. Flint, and CCEA has just as consistently opposed them. Fortunately, new regulations have been imposed on the existing facilities with regard to legal uses, fire hazards, and removal when their use has been terminated. On the other hand, permits to expand the radio facilities for flood control, fire, police, and other protective measures have always been supported by the Association. A ‘cut-and-fill’ dump site in Sicomoro Canyon at the Pasadena boundary line off Linda Vista was proposed in the late 1960s. The developer sought approval to dump rubbish collections and material from other cut-and-fill operations. This project met with firm opposition from CCEA. At the City Council hearing, CCEA Directors argued that the City did not need, another dump site because the new Scholl Canyon Dump would soon be in operation. Furthermore, CCEA opposed the constant reverberation of noise which would result from dump trucks passing over the winding Chevy Chase roads for years to come. Thanks in part to these arguments, the City Council denied this request for a trash dump on upper Linda Vista. Cantilevered houses began to appear in the valley, and the Association found these objectionable in several respects. Unpainted understructures were unsightly to residents living beneath them. The exposed supports were vulnerable to fire. There were no provisions made for escape from the structures except at the street level on the front. The CCEA Directors and committee members asked the City Council to review the present ordinances and to set new guidelines for this type of hillside building. In the interim, the Architectural Advisory Committee urged prospective builders to enclose the understructure and to provide an exit at the rear as a safety measure in the event of fire in the front part of the house. Chevy Chase Midcentury Modern home. Few incidents arouse the collective wrath of canyon residents as much as when canyon wildlife began to be hunted with bows and arrows. Propelled by angry protests from CCEA members urging that this practice be brought to a swift halt, Association Directors lost no time in urging the City Council to pass an ordinance forbidding this sport in the canyon. The existing ordinance concerning the transport of weapons was soon amended to include bows and arrows. In 1958 the News-Press again headlined that the Golf Club was to change owners, who planned to construct a new and exclusive private club house with pool. This was good news to canyon residents. But several months went by before memberships were solicited, and enthusiasm began to wane. For one thing, the guidelines were vague about the role of members in the operation of the club. 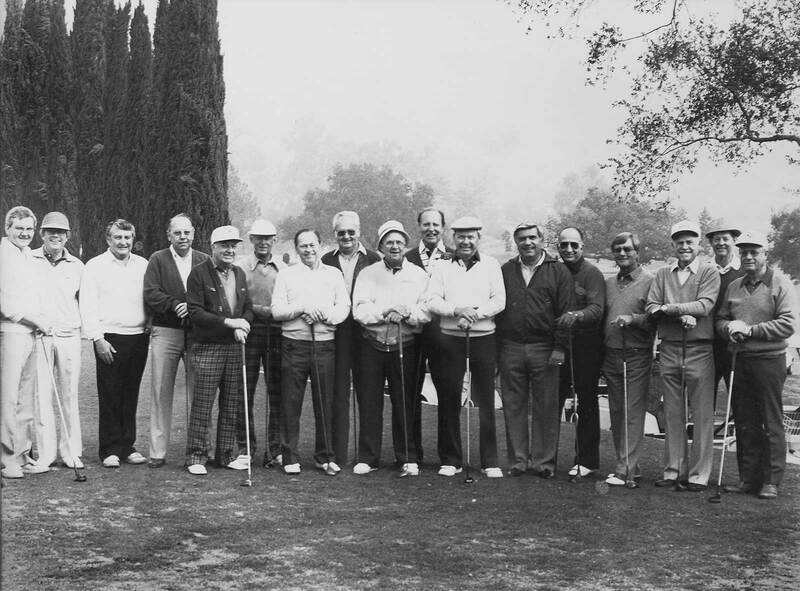 For another, newspaper advertisements soliciting memberships were being published throughout the Los Angeles area, suggesting that canyon members would have little say in Golf Club affairs. The trial and error approach of the inexperienced operators brought dissatisfaction and disappointment, however, and membership support fell off. In February 1963, a meeting of the Golf Club members was called and they were informed that the Club was operating at a loss of several thousand dollars a month and that further losses would force liquidation by subdivision. A committee of members was appointed to negotiate with the lessees and owner of the Club for a sublease contract. Several weeks of meetings and study came to naught. Then the report came out that definite plans for subdividing the golf course were afoot, that a shopping center was to be included in the plans, and that a change in zoning would be sought to accomplish all of this. 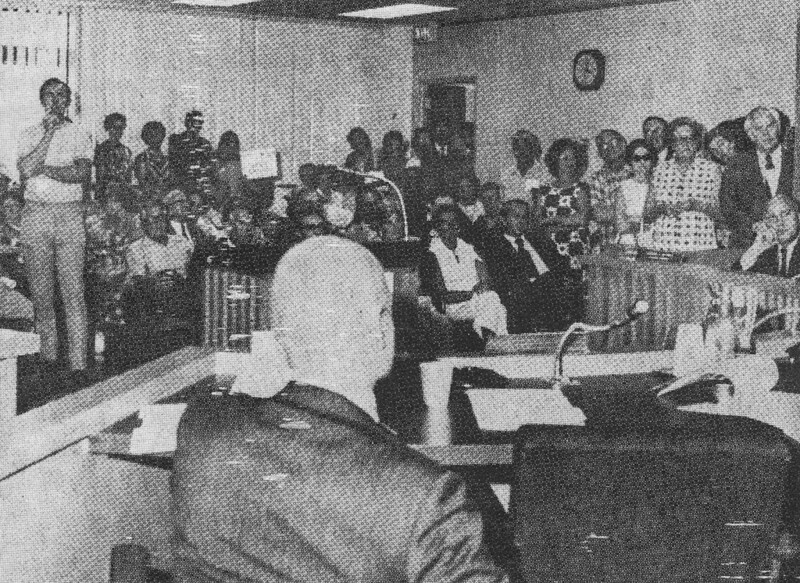 The Directors of the Chevy Chase Estates Association responded promptly with a mass meeting of the CCEA members on June 2, 1963. By unanimous vote the members resolved that the City of Glendale be petitioned to purchase the Club. Petitions were circulated in all parts of the City, and in less than two weeks almost 3000 signatures had been collected. These were presented to the City Council. However, the Mayor at that time reported that the operators of the Club had denied all rumors that the Club was to be subdivided, that the Club was financially successful, and that the operators expected to continue operations. It was not the policy of the City, the mayor advised, to interfere with successful enterprise. The ‘success’ of the Club was news to Association members. With this experience in mind, the Association enthusiastically endorsed the proposal of the Glendale city planners for a ‘special recreation’ (SR) zoning ordinance to preserve Glendale’s recreational areas and facilities. The initial ‘enabling ordinance’ had to be adopted first, and there was little opposition to it. But the ‘definitive ordinance,’ placing Glendale’s two golf clubs under its protection, ran into stiff opposition by the lessees and owner of Chevy Chase Country Club. Oakmont Country Club was silent. Attorneys represented the Country Club were successful in convincing the Planning Commission to vote 4-1 against the definitive ordinance. CCEA members were disappointed, to say the least. With renewed determination, the CCEA Directors decided it would be wise and prudent to engage legal counsel to represent the Association when the definitive ordinance came up for discussion before the City Council. Delays and postponements ran into fall, but on October 15, the hearing was held at City Hall. The Council Chambers were filled to capacity with CCEA members and the overflow stood along the aisles and lined the halls. After a tense hour listening to both sides of the argument, the City Council voted 4-1 in favor of the definitive ordinance, with the final vote for its adoption coming on October 25, 1963 – thus insuring that the property could never be subdivided and preserving the Chevy Chase golf course for posterity. Or so it was thought . 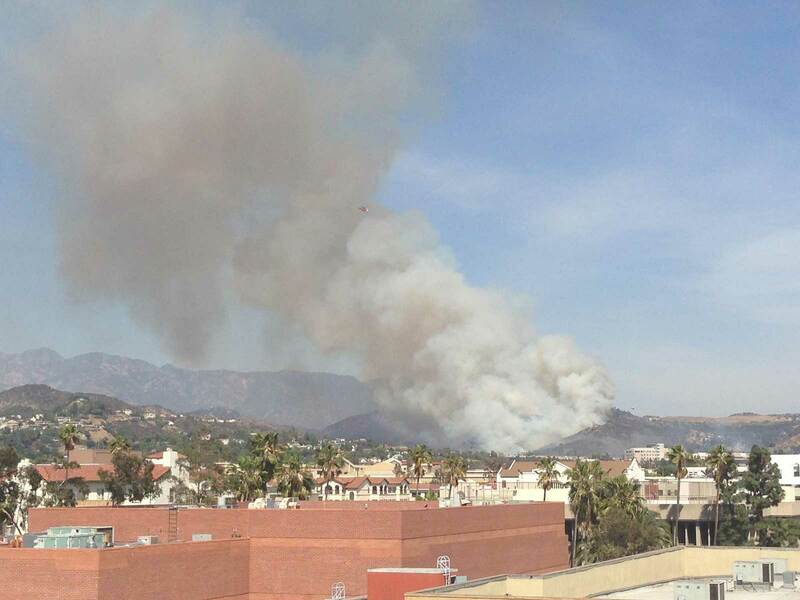 . .
Like any community nestled among brush-covered hills, Chevy Chase Canyon is vulnerable to range fires. These usually occur when warm desert Santa Ana winds lower the humidity, drive up the temperature, and fan what may start as a minor fire into an inferno. Any canyon can also be the setting of a ‘firestorm,’ in which the heat from fires in the bottom of a canyon creates a huge upward draft, setting more fires along the sides of the canyon and sending burning embers high in the air. These can ignite fires often far distant from the original flames. The most serious fire in recent years began on Monday, March 16, 1964, at a time when hot dry desert winds had been searing all of Southern California. Early in the morning the winds snapped high-voltage lines north of the Golf Club, starting a small fire. Winds had been recorded at 73 miles per hour, with gusts up to 90 miles per hour. Powered by the winds, the fire leaped out of control, and soon was threatening Emerald Isle on the north, had crossed the ridge and was burning down to Verdugo Road on the west, and soon was progressing down the ridge line to the south. 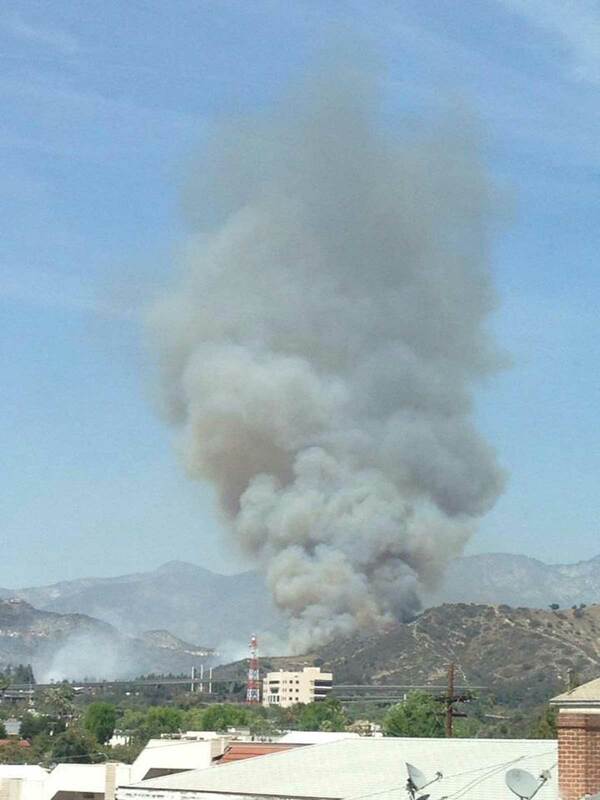 Glendale City College was evacuated, although some students stayed to fight the fire nibbling at its perimeter. Amazingly, in the first few hours, no homes had burned. But then the southern tip of the fire turned east, and as it burned down the Ridge-Solway Canyon toward Chevy Chase, the first ‘firestorm’ conditions occurred, and several homes in this area burned to the ground, including one on Chevy Chase Drive. Burning embers soon set brush afire on the east side of Chevy Chase Canyon, and soon the fire was in Scholl (Glenoaks) Canyon. Another firestorm occurred, resulting in the loss of 16 homes. 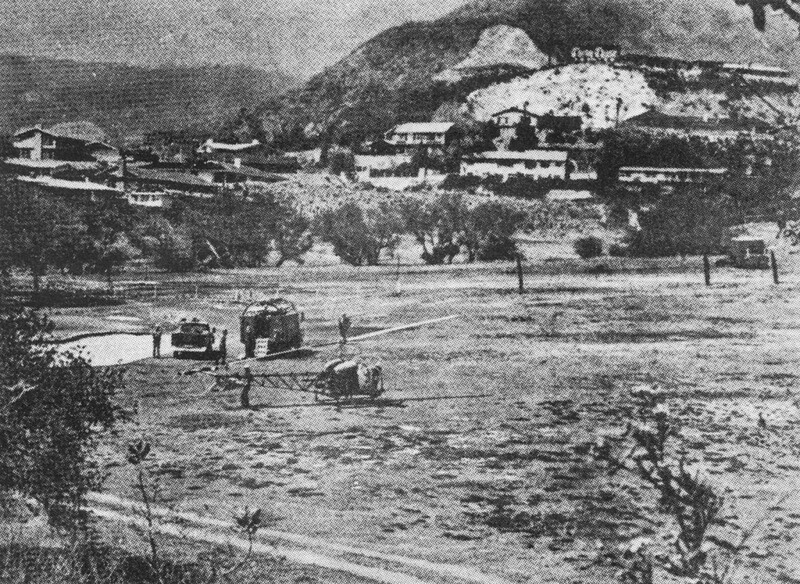 While being contained elsewhere, the fire roared on east into Eagle Rock, destroying 7 homes, and on to the fringes of Pasadena, threatening the Annandale Country Club. The Chevy Chase Country Club became a fire department command post, with helicopters landing and taking off from the fairways. The Los Angeles Times reported that, in the midst of the feverish activity, a fireman answered a ringing telephone and heard someone say “I want to get a starting time.” The golfer was politely informed that there would be no golf opening for the rest of the day. The Country Club was the Fire Command Center for the 1964 fire, with helicopters on the fairways. All this time, an even larger but less destructive fire was burning north of Glendale and Burbank, in the mountains separating those cities from La Cresenta and Montrose. The fire burned 7,000 acres and had a 20 mile perimeter. Fire burned to the edge of the Oakmont Country Club. Six homes were burned to the ground in the Whiting Woods area of north Glendale and two others near the Burbank city limits. The Chevy Chase fire (or, as it became known as it spread, the ‘San Rafael Fire’) was finally contained on Tuesday afternoon, March 17. Over 300 people, who were evacuated Monday morning when it appeared the fire would come down to the floor of the canyon, returned to their homes. The fire had burned 2100 acres and, at one time, had a perimeter of 12 miles. Governor Pat Brown flew over the area and then signed a proclamation declaring Glendale a disaster area because of the fires. ON BEHALF OF THE RESIDENTS OF CHEVY CHASE ESTATES, PLEASE THANK PUBLICLY THE GLENDALE FIRE DEPARTMENT. THEY HAVE DONE A TREMENDOUS JOB. ALSO THANKS SHOULD GO TO . . . THE PUBIC SERVICE DEPARTMENT FOR HAVING PROVIDED WATER SO THAT NO CATASTROPHIC FIRE COULD OCCUR AS HAS HAPPENED ELSEWHERE. 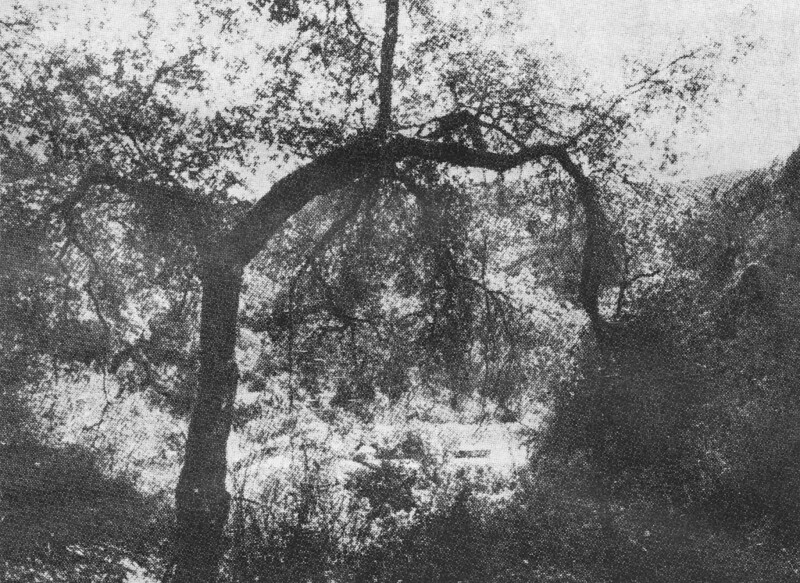 Canyon residents had another scare in November, 1969, when hurricane velocity winds caused high-voltage lines near the Flintridge-Glendale border to arc, sending sparks cascading down into the brush below, causing another fire to start. Witnesses had seen the fire start and called the Fire Department, who were able to block it from moving into Flintridge. But, fanned by 50 mile an hour winds and aided by 7% humidity, the flames moved down the canyon, skirting Emerald Isle, and once again moved toward the Country Club before they were doused after a five-hour attack with water-laden helicopters. The other fire started along Linda Vista in a brushy area east of Chevy Chase Drive. Flames quickly accelerated up the slope, and the houses at the corner of Linda Vista and Figueroa periodically disappeared behind a curtain of smoke or flames, only to emerge intact as the fireman fought back the fires. “It was a battle,” said one witness, “and the firemen were determined that the fire would not get those houses” – and it didn’t. 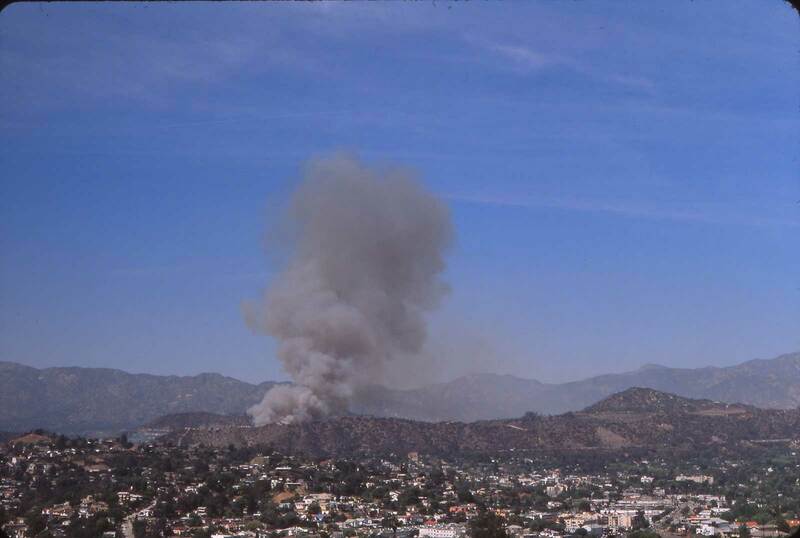 The fire continued over the gap toward Pasadena and briefly threatened the Art Center, but was declared controlled by early evening. Many people were upset, even furious, when the Fire Department permitted no automobile traffic (not even residents) on Chevy Chase Drive north of Harvey Drive. Other roadblocks were established at the north end of Chevy Chase Drive, and on Linda Vista at Chevy Chase. Many people, concerned about their loved ones in the fire area, either walked up the canyon to their homes or hitched rides with motorcyclists (who were not banned from the street). The possibility of a fire is a fact of life in any canyon. These experiences serve to remind all those living in Chevy Chase Canyon of the need to take some simple precautions to prevent a tragedy. Roofs should be of flame-retardant material. Brush should be cleared away from homes and replaced with native fire-resistant plants (the Fire Department has a list of recommended species). Homes with swimming pools should have gasoline driven water pumps and hoses for use by the resident or firemen in an emergency. Hanging over everyone’s head in 1964 was the proposed Foothill (210) Freeway which was to cut a wide swath somewhere through the area. 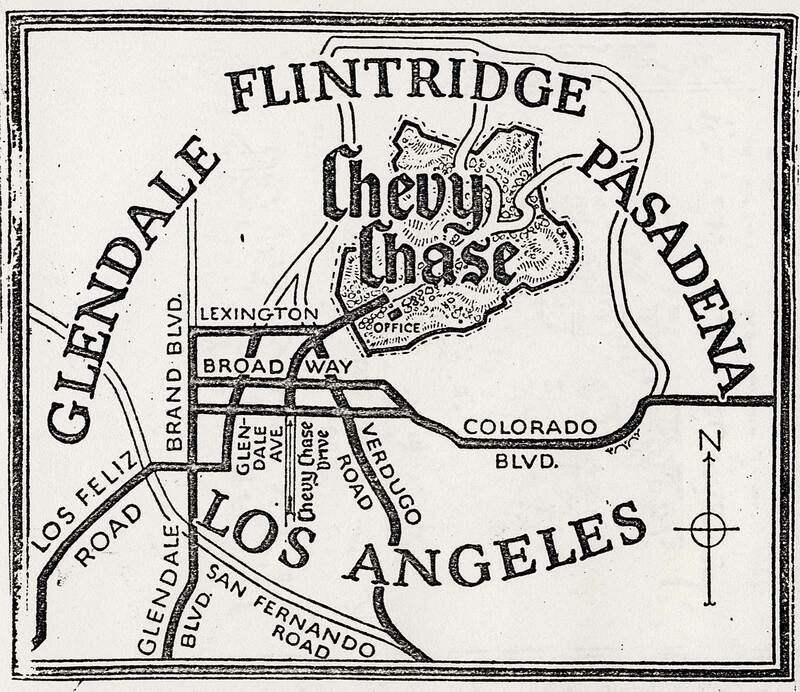 The upper valley communities of La Crescenta and La Canada were well-organized and vigorously opposed the location of the freeway in their area, while the equally well-organized Chevy Chase Estates Association opposed it just as strongly in this area. 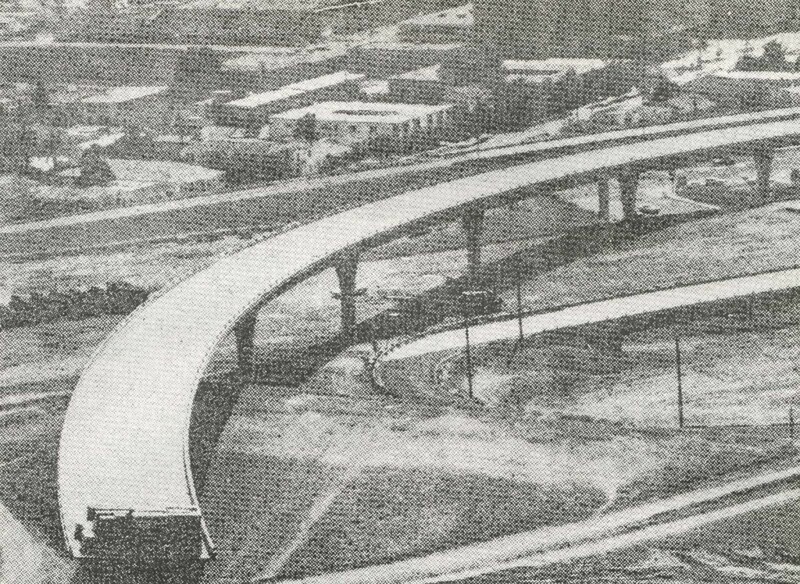 On July 11, 1969, construction continued on the Ventura (134) Freeway east of Harvey Drive, but the curving connecting ramp to the future northbound Glendale (2) Freeway was blocked for years. 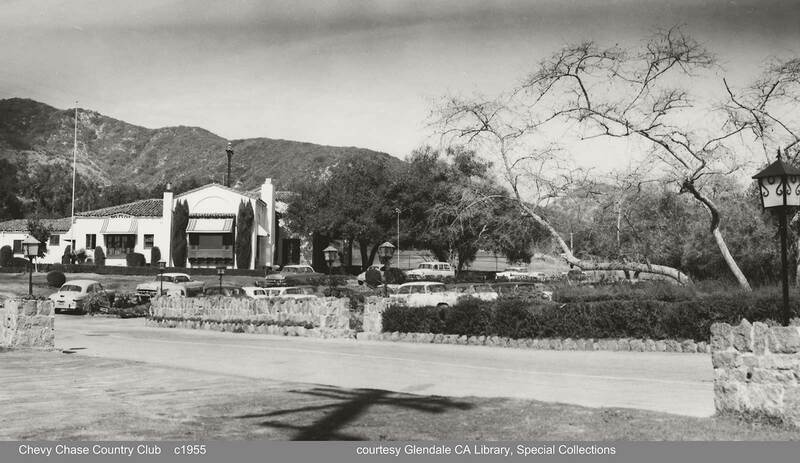 CCEA joined with the City of Glendale in requesting and gaining a place on the agenda of the hearing of the Division of Highways on June 1, 1964, when the route of the freeway would be discussed. The meeting lasted until 8 p.m., due to the ‘lengthy discussions’ of the upper valley representatives. The Glendale and Chevy Chase speakers spoke last, and apparently most effectively, for in September 1965, the Division of Highways eventually recommended the La Tuna Canyon route, the one that CCEA and the City of Glendale urged. The Glendale (2) Freeway was completed from its southern terminus to Verdugo Road and Eagle Rock Boulevard, and then remained quiescent for many years while the state debated the route of the northern extension to the Foothill Freeway. There was initially some concern that the Glendale Freeway might be routed up Chevy Chase Canyon; fortunately the state never seriously considered this option, and made an early decision to run it parallel to Verdugo Road to Mountain Street, and then striking north across largely undeveloped terrain to its junction with the Foothill Freeway. Chevy Chase Country Club Destroyed by Fire! That was the headline on the Glendale News-Press on July 28, 1964. Late the previous evening, nearby residents could only watch as flames destroyed the interior of the canyon landmark. Built in 1927, the Golf Club was the recognized social center of Chevy Chase Estates, the ‘home’ of Association gatherings, frequently the meeting place of the Garden Club and other associations, the golfer’s retreat, the scene of countless wedding receptions, fashion shows, banquets, parties, and dances. Glendale firemen swarm over the roof and into Chevy Chase Country Club to stop the fire. 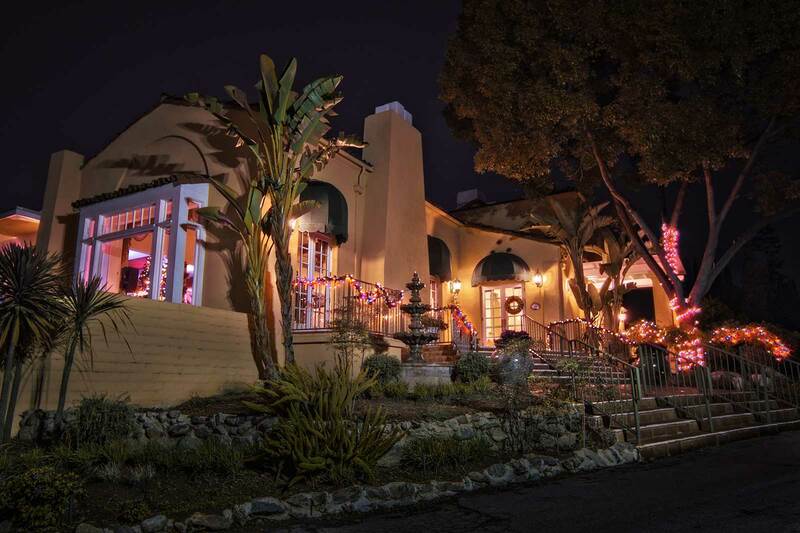 Only four months before, the Country Club had been the command post for the fight against the massive brush fire that swept through the Glendale hills, and the headquarters for the radio and television coverage of the fire. Later, it was the ‘jumping off’ point for helicopters dispatched to reseed the charred hills. And now the Country Club itself was charred, and much of the building was ruled unsafe for occupancy. Still, the pro shop was intact, the swimming pool was not damaged, and a temporary food stand was erected. The operators said the club house would be rebuilt and that summer activities around the pool and golf course would continue without interruption. A wedding with 400 guests was held on the golf course. But hardly a week later residents heard a new word that wasn’t too familiar then: condominium! Plans had been drawn up for a new six to eight-story structure, with shops occupying the first floor, the Golf Club the second floor, and condos and/or apartments on the upper floors. The golf course would be reduced to a par-3 pitch-and-putt course. This was all in violation of the new R1R and SR zoning ordinances. The CCEA Directors lost no time in exposing this threat to all canyon residents as well as to City officials. On August 30, 1964, a mass meeting of the Association was held and a motion to collect voluntary contributions of $10 per member was passed unanimously. The operators of the Club countered with a letter to area residents, stating that they could not rebuild unless they received a large insurance settlement, and again claimed they had been operating the County Club at a loss for several years. They proposed two solutions: one solution was ‘condominium,’ the other was ‘subdivision.’ Virtually all of the 500 homeowners then living in the canyon signed petitions stating that they would resist to their utmost any attempt to alter or circumvent the existing R1R and SR zoning. These petitions were presented to the City Council on September 22, 1964. The following day it was revealed that the fire insurance company had settled favorably with the owners of the Club, and bids were being accepted by the owners and operators to rebuild the club house. The sigh of relief that everyone breathed lasted only two weeks. 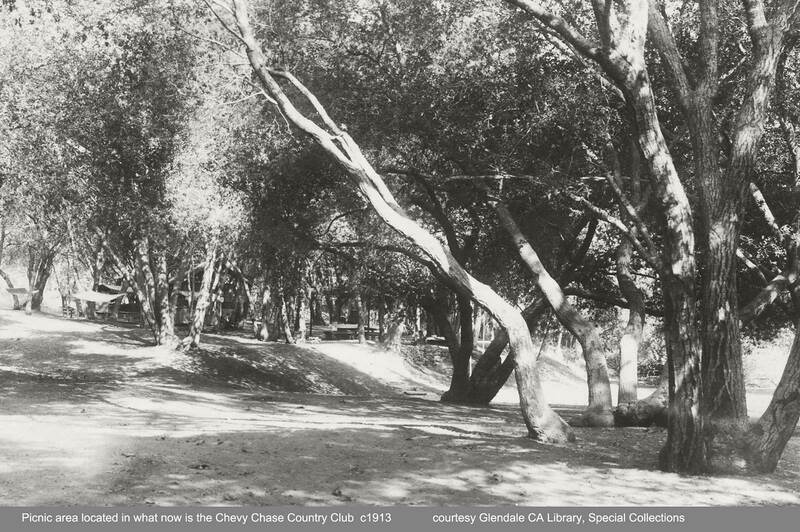 On October 6, 1964 the Glendale School Board voted to purchase Chevy Chase Country Club for $900,000, for the purpose of building a new high school, a new junior high, and a new grade school on 38 acres of the golf course. The owners of the Country Club had accepted the offer. This surprise move was read with utter disbelief by residents of the canyon and indeed, by the entire city. The Association mobilized against this new threat almost immediately. Special meetings of the Board of Directors were held weekly. A strong letter of protest was written to the School Board, requesting that no determination be made until answers to certain questions were provided. The members of the Chevy Chase Country Club also announced their disapproval and concern, among other things, about the loss of their investments in the club. The November 7, 1964 meeting of the School Board had to be conducted in White School Auditorium to accommodate the large number of people attending. When asked to respond to some of the ‘why’ questions previously submitted in writing to the School Board, one of the members replied “We do not answer questions.” Area spokesmen pointed out that three schools on one site would be just asking for trouble, that destroying open lands that could never be replaced would be a disgrace, and that other sites in Chevy Chase were more suitable for schools. After a stormy session, the School Board voted for a 60-day delay. On November 17, 1964, the CCEA Directors voted to begin legal proceedings, and Director Tom Knudsen (the creamery owner) volunteered to file a taxpayer’s suit on behalf of himself and other residents. This suit was filed on December 15 in Glendale Superior Court, declaring the School Board’s purchase to be ‘void and unconstitutional.’ A restraining order was also sought, pending a hearing on a permanent injunction. In a parallel action, a group of concerned members of the Country Club had been working out plans to buy the Club for $800,000 and operate it themselves. They were keenly upset at the possible loss of their equity in the club, and one of these members, Francis J. ‘Red’ Hinckley, also filed suit on behalf of the members of the club, stating that he and some 350 other members had paid over $265,000 for memberships and should be entitled to compensation. The year 1965 started out with a note of victory for CCEA, when the School Board agreed, at a hearing in Los Angeles Superior Court, to delay further action on purchasing the Club. On January 18, 1965, a special public meeting was called by the City Planning Commission, and once again was attended by a capacity crowd. The Chief City Planner recommended that an elementary school could be built on the course and still retain a park-like atmosphere. 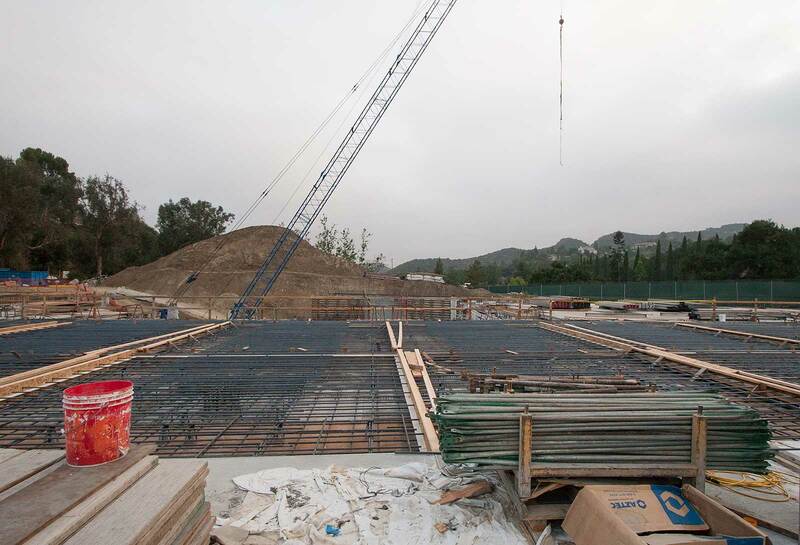 But a week later, the Planning Commission unanimously voted to disapprove the Glendale School Board’s plan to buy the Country Club for school sites, on the basis of the facts that the area’s topography and limited access roads risked the children’s safety. The Glendale School Board, however, renewed its determination to acquire the golf course. This led to threats of recall and counter-charges against the CCEA. The directors voted to run a quarter-page ad in the News-Press to correctly state the position of CCEA in the matter of the School Board’s acquisition of the Golf Club property. 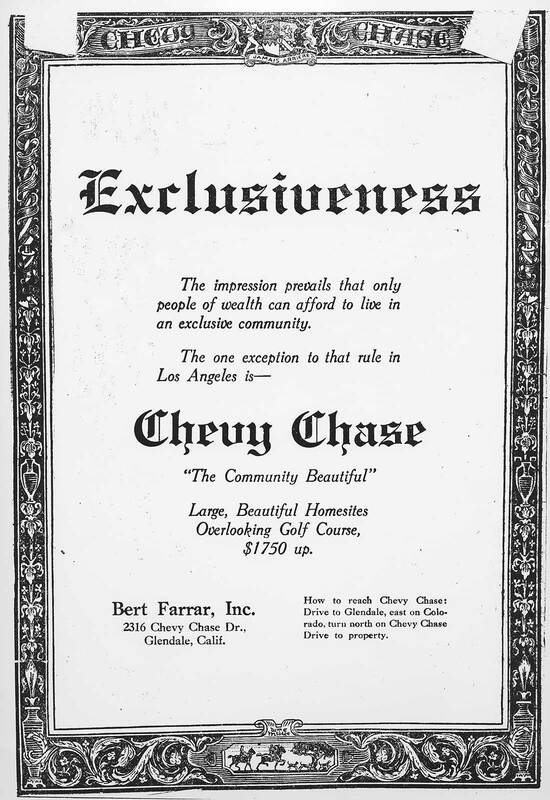 By this time newspapers were referring to the group as “the powerful Chevy Chase Estates Association.” Radio and television stations were providing regular reports , and the Los Angeles Examiner devoted almost an entire front page of one issue to the controversy. The School Board meeting on February 16, 1965 was again held in White Auditorium, and again had a capacity crowd. The major news was that the golfers’ group had pledges from about 70% of their members to raise the minimum of $200,000 as down payment to the owner for their purchase of the Club. After a marathon session lasting three hours, the School Board moved to postpone action until the March meeting . . . and then till May and then to the June meeting. In all, there were 14 delays until November 1965, when the School Board withdrew in favor of the golfers’ group. But the agreement left the door open for the School Board to take an option on the Country Club property should it ever cease to be used as a golf course. Meanwhile, the golfer’s group succeeded in selling sufficient memberships to meet the down payment on the Golf Club property, and the golf course belonged to the golfers. It was incorporated as the Chevy Chase Country Club, Inc.
Chevy Chase Estates residents gained considerable satisfaction when the new SR zoning obtained two years earlier was first used on December 22, 1965 when the Parks and Recreation Commission reviewed and approved plans for the new Chevy Chase Country Club. Restoration of the club house began shortly after the start of 1966, and its formal opening was celebrated on June 11, 1966, with a black-tie dinner dance. The bridle trails that once criss-crossed Chevy Chase Estates have now largely disappeared. Yet, they remain visible on tract maps as narrow strips of land between rows of lots – averaging ten feet wide and sometimes much wider. The founders of Chevy Chase Estates deeded these bridle trails to the city to be preserved and maintained as open space. Most of them have now been abandoned, though. A typical bridle trail paralleled Golf Club Drive to the south, beginning at the top of Paddington and, following the natural drainage, meanders its way across Edgewick, Graceland, Edmonton, and ending at Chevy Chase Drive. Most of these narrow strips have simply been unofficially annexed by adjacent property owners. For a while, a wider portion of the this trail at the top of Paddington was maintained by the City as a ‘mini-park,’ but in early 1965 the City Planning Division advised the Association that the city planned to abandon it. Association officers voiced their objection to the loss of any public park, but in vain: the area has been allowed to revert to its natural state. One of the most famous of these bridle trails – and certainly one of the steepest! – was transformed by past city fathers into a public thoroughfare called Stuart Walk. . . which is discussed later in this booklet. Just as the 30-year-old concerns about preservation of the golf course began to abate, a new problem arose that was to replace the golf course as the chief activity of the Chevy Chase Estates Association for the next 20 years. That problem was uncontrolled subdivision. That conflict was to become an ongoing affair, and became intensified as land values rose. Reflecting the views of the canyon residents, the CCEA Directors did not oppose subdivision and development per se, as long as they strove to maintain our rural enclave in the midst of frantic urban development. The Association has always opposed commercial and multiple-dwelling residential development in the canyon. A former white elephant subdivision is being transformed into one of Glendale’s finest neighborhoods. But the $5.3 million tract at the top of Chevy Chase Canyon is still dogged by legal problems of the 1952 vintage. The present owner of the subdivision will soon be selling 106 of the most attractive home sites in Glendale. The subdivision has been defunct since the original owner’s grading proved not acceptable to the county. It was a terrific mess when the area was annexed by the city of Glendale, with substandard streets and drainage. The new subdivider has graded it to city standards. In 1971 the ‘Flintridge Terrace’ tract of 279 homes in the Emerald Isle area was approved by the City Planning Commission and City Council, and CCEA endorsed this well-planned development of single-family homes. By contrast, the Association strongly opposed the plans of a builder, who in l964 sought to build condominium apartments, a private school and ‘a private club’ southeast of the golf course, on property extending along the dead ends of Thurlene, Graceland, and Edmonton. The builder made a written request that the CCEA Directors approve their request for a variation in the R1R zoning. Needless to say, the Directors bluntly refused this request; the plans for the condos indicated that they were to be cheaply built, and the result could well be ‘a slum in our midst.’ Thus quelled, the builder went away and was never heard from again. The overflow crowd of Chevy Chase homeowners at the Glendale Planning Commission hearing on the first Hensler-MacDonald project forced a move from the hearing room to City Council chambers. That term, ‘went away and was never heard from again,’ could never apply to developer R. R. Hensler. 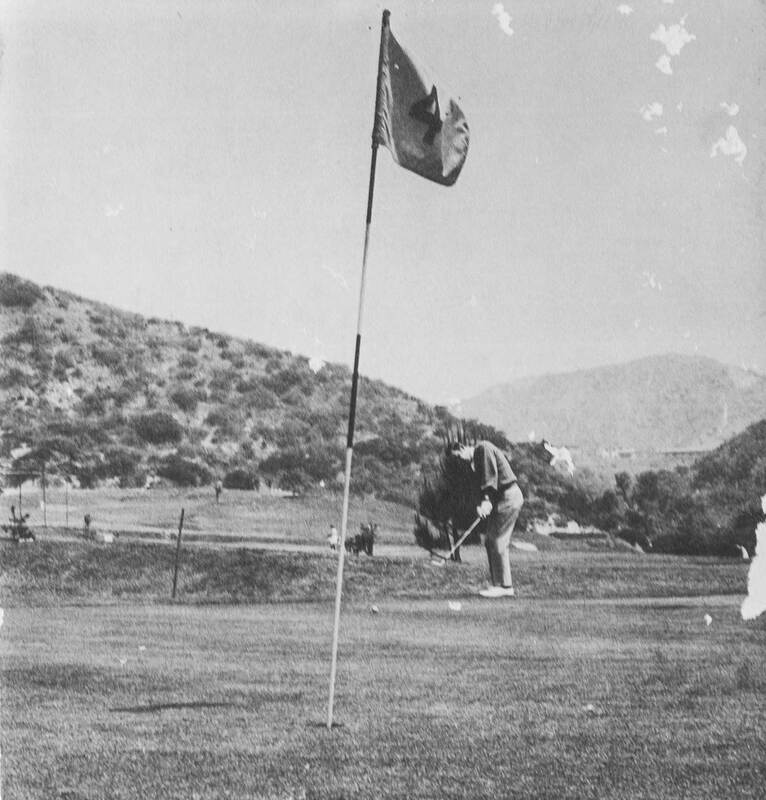 After several tries, on March 9, 1965 he gained approval of the Glendale Planning Commission to build 325 ‘high caliber’ homes and a pitch-and-putt golf course on land that he owned between Verdugo Road and lower Chevy Chase Canyon. This, of course, was the beginning of the ‘Hensler-MacDonald development’ which is still unbuilt today. Actually, some CCEA Directors favored the original project, since it was to be single-family homes and especially since it was to provide another access road into the canyon, and the thereby lessen the traffic on Chevy Chase Drive. But for this very same reason, other Directors disapproved of the project, because they did not want another road into the canyon; they argued that Cascadia, the access road usually cited, could not handle much added traffic, and the other alternative, a road over the ridge to Emerald Isle, would scar the hills and would not greatly decrease the traffic on Chevy Chase Drive. ‘The road’ remains controversial to this day. But the Association was 100% opposed to the Hensler development when, late in 1965, it was found that the Hensler interests were requesting ‘certain changes to permit other than single family residential use’ – in other words, a zone change. This became official in early 1966, when the developer asked the Planning Commission to permit a change in zoning from R1R to permit commercial and high-rise construction. The CCEA position was that it had no objections to a strictly single family residential subdivision on the canyon’s western edge, but it was strongly against any departure from R1R zoning. Responded a Hensler representative (in a newspaper quote): “Condominium apartments are needed to give a park-like entrance and commercial areas are needed for residents within the subdivision and adjacent residents. These convenience centers are essential.” On February 28, 1966, the Planning Commission rejected the zoning change request. The next year the Hensler interests returned with a request for another zone change, this time to ‘CC’ (convenience center) and ‘ZV’ (high-rise) zones. Their new plan was to be ‘a city within a city,’ with residential, commercial, and industrial zones on a 167 acre site astride the San Rafael Hills. That plan was quickly rebuffed by the City. Later in 1967 the newly reorganized Hensler-MacDonald Company returned with the proposal for 279 single-family residence units, but also 11 clustered two-to-seven-story garden condominiums and two ‘convenience centers’ (shopping centers). This would be grouped in the southern part of the property, with the ‘open area’ on the northern part to be occupied by a nine-hole, par-3 golf course. It would be “a skyline community of high density that would respect topography.” CCEA aggressively opposed this plan because of the high-density condos and the convenience centers and because it would involve a change in the R1R (restricted single residence) zoning. Hearings, arguments, new proposals, and delays marked the l968 progress of the Hensler-MacDonald development, and in early 1969 they withdrew the zoning change request. 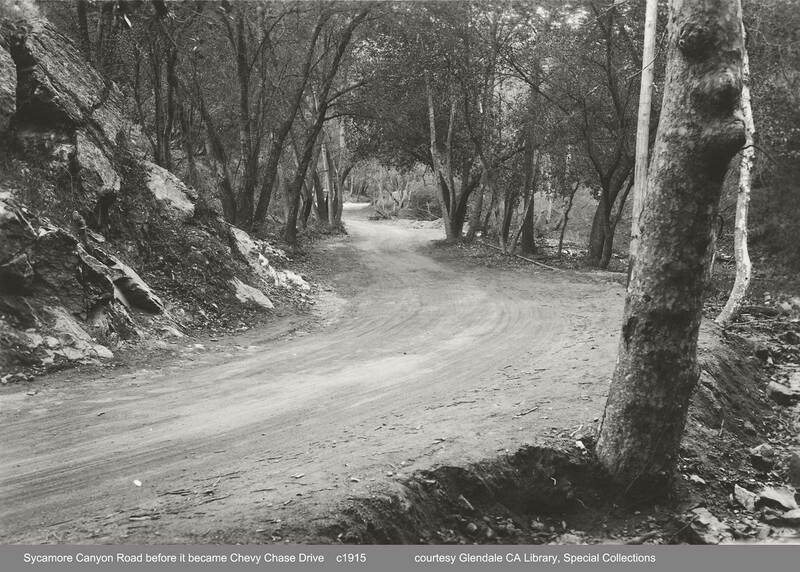 Chevy Chase Drive was originally built with county funds as a flood control channel, with high (18″ to 24″) curbs to retain the water, mud, boulders, and debris as they drained from the slopes and the water began its long overland journey to the Los Angeles river. Floods had often wrought havoc in the canyon and a major flood occurred in Chevy Chase Canyon unseasonably late in April, 1965, as a result of rain, rain, and more rain. With the hills denuded by the previous year’s fires, mud and mudslides presented a major problem. 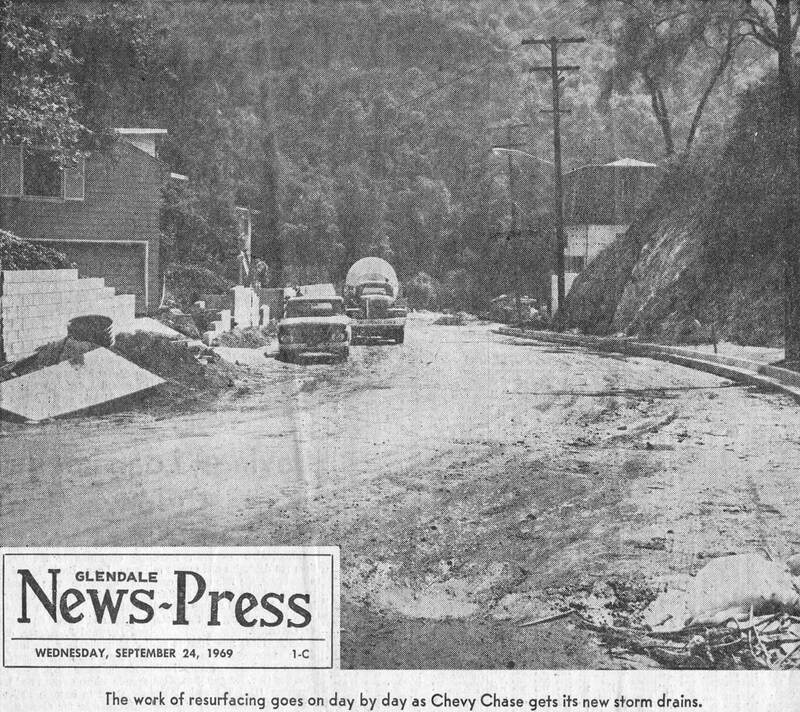 Later that year, in November, the rains struck again, and the News-Press carried the banner headline “Floods Ravage Glendale Homes” – and they were referring to Chevy Chase Canyon, where water flowed off the hills, sweeping mud, brush, and boulders into Chevy Chase Drive and making it impassable. The street was closed to all traffic from Cascadia to Golf Club Drive. A home at the corner of Sheridan and Golf Club Drive was undermined by the runoff waters and collapsed into the rain-created gully behind it. It was then announced that a flood control channel (or ‘storm drain’) would be built under Chevy Chase Drive in three years. City engineers stated that construction couldn’t begin until there were more access roads into the area, since the project would close Chevy Chase Drive to traffic. 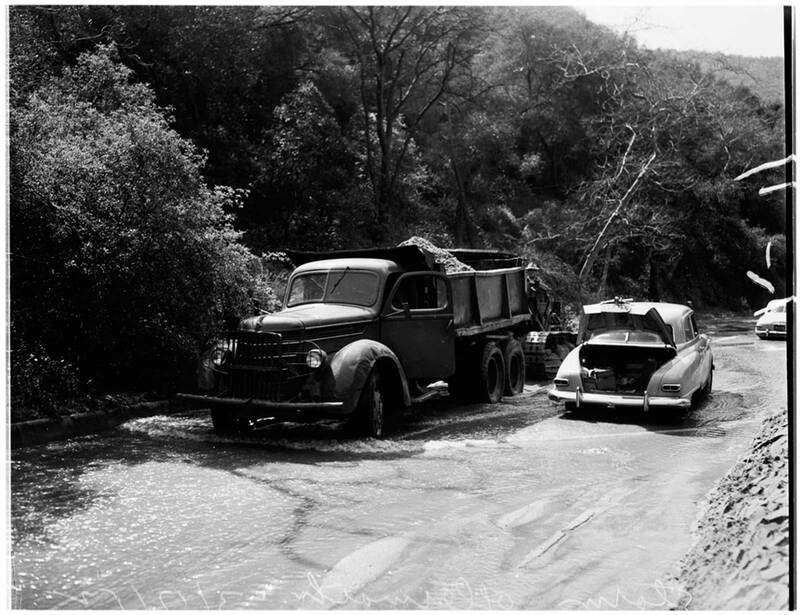 But canyon residents felt that three years would be too long to wait, and their concern was emphasized when another deluge hit the canyon on December 30, 1965, creating more flooding and more mudslides. Bypassing City channels, Directors of the Chevy Chase Estates Association appealed directly to the Los Angeles Flood Control District to have plans expedited, and in late 1966 they gained a promise that plans for the flood control channel would be developed in mid-1967 and that construction would start early in the spring of 1968 and would be completed by October 1969. The plans called for nearly two miles of storm drains to be laid beneath Chevy Chase Drive from Glenoaks to Linda Vista, consisting in the lower canyon of concrete box drainage conduit varying in size from 16×13 ft to 11×9 ft and in the upper canyon of reinforced concrete drain pipe ranging in size from 27 to 81 inches in diameter. The total cost was estimated to be $3.8 million. All underground gas and water lines would have to be temporarily relocated, old power and telephone poles in the way of construction would have to be removed and temporary new ones installed, and sewer lines would have to be detoured. At the same time, all utility poles that once blighted Chevy Chase Drive were put underground. Before this could be done, at least 51% of the resident with homes fronting on Chevy Chase Drive had to agree to it (this was easily accomplished), and they had to agree to an assessment of $246 per home (this caused some grumbling, although the City and the utility companies absorbed much of the overall cost). 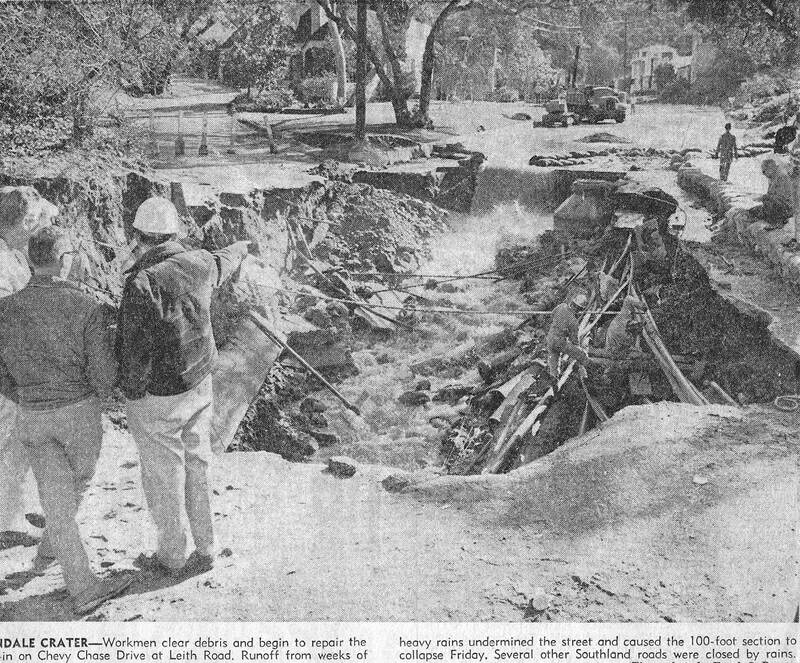 Disaster struck in late January 1969, when 18 inches of rain in four days transformed the street into an open flood channel, with rocks, logs, silt, and debris roaring through the trench that once was Chevy Chase Drive. The temporary pavement was obliterated, isolating homes along Chevy Chase Drive. 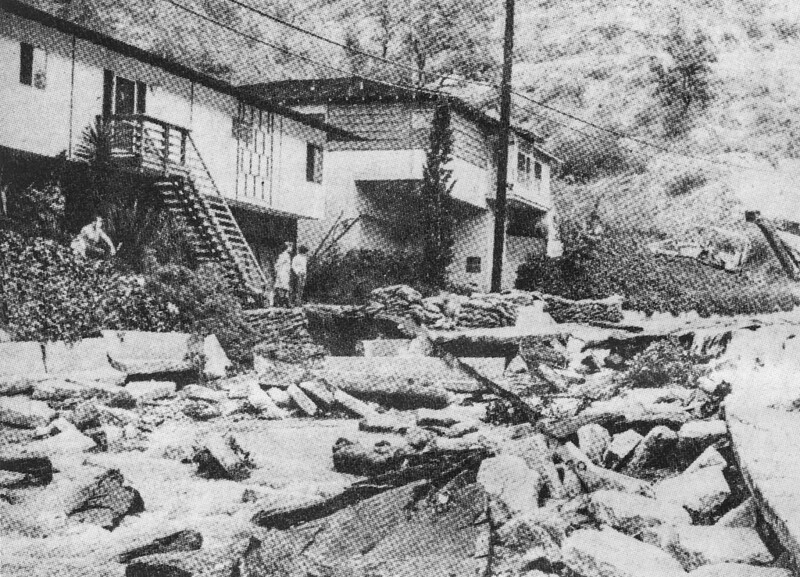 Mudslides threatened many homes, especially on Larkstone, when mud began backing up against the houses. Two women from Indiana, visiting relatives in ‘sunny California,’ died when mud crushed the Buckingham area home where they were staying. The 2600 block of Chevy Chase Drive, as viewed by stranded residents on January 28, 1969. And it got worse. On February 26, 1969, 5.2 inches of rain fell, bringing the season’s total to 31.32 inches of rain, “the most since 1889.” Chevy Chase Drive once again was transformed into a seething mass of water, mud, and debris. On February 28, residents of the 2200 block of Chevy Chase Drive heard a loud roar at dinnertime, rushed outside in the rain, and found that a huge hole, large enough to swallow a house, had opened up in the middle of the street. The rushing water had undermined a section of the street, leaving a hole 25 feet deep, 40 feet wide, and 70 feet long when the asphaltic concrete shell covering it collapsed. Several cars narrowly missed running into the cavern, alerted only by residents waving flashlights. The storms at last subsided, but construction was seriously behind schedule. 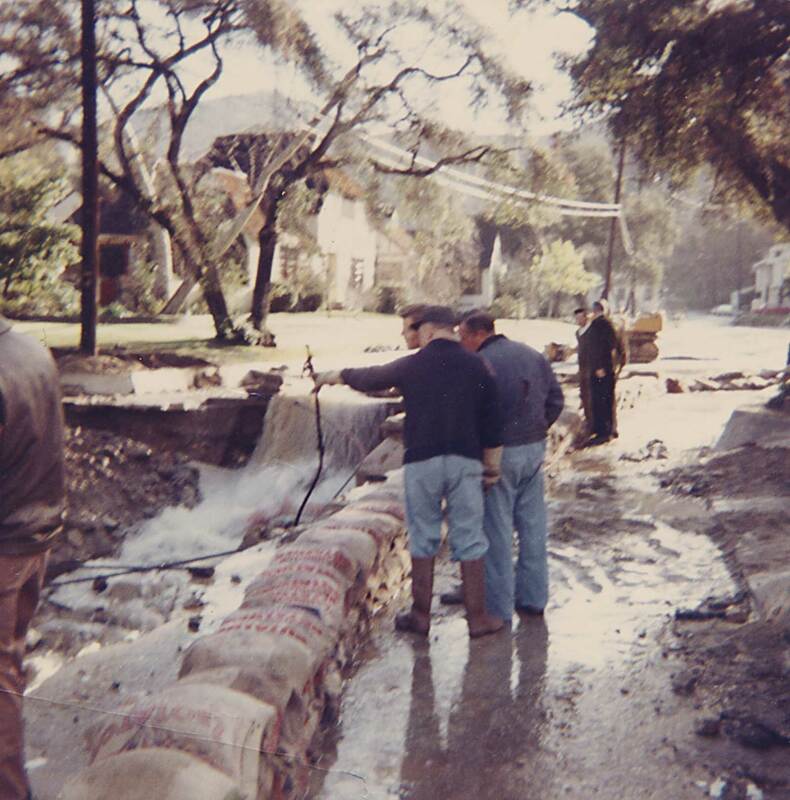 Just when things were looking better, in the summer of 1969, a heavy equipment operators’ strike brought work to a standstill with 1,000 feet of storm drain box yet to complete – and the winter rains coming closer and closer. Members of the Associations’ Board of Directors, as well as City and County officials, pleaded with the with the union to allow work on this vital project to continue – and this request was granted. Work was also being done on a major debris basin (to filter out rocks and logs and such before they entered the drains). This was constructed on a small piece of city-owned land at the loop of Golf Club Drive at Chevy Chase Drive. A secondary debris basin was constructed in Linda Vista Canyon, near Cornwall. Nearby residents initially protested the ugliness of the basins, but eventually landscaping made the areas more attractive. The drains were completed in October, 1969, and on December 16 a ‘Flood Control Channel Celebration’ was held, with a ribbon-cutting ceremony at Cascadia, and then a motorcade up newly-paved Chevy Chase Drive to the Country Club for speeches by City, County, and Association officials and cocktails for everyone. Over 500 people attended the festivities. This also helped promote the Country Club, which had lost considerable business as a result of decreased access during construction. Heavy rainstorms would never again turn Chevy Chase Drive into “the river street of the rainy season,” as it had been described. However, because of its very steep nature, the canyon floor is still vulnerable to blockage. Rocks, debris, and mud are occasionally washed down the steep canyon walls, which impedes traffic or temporarily closes the street. 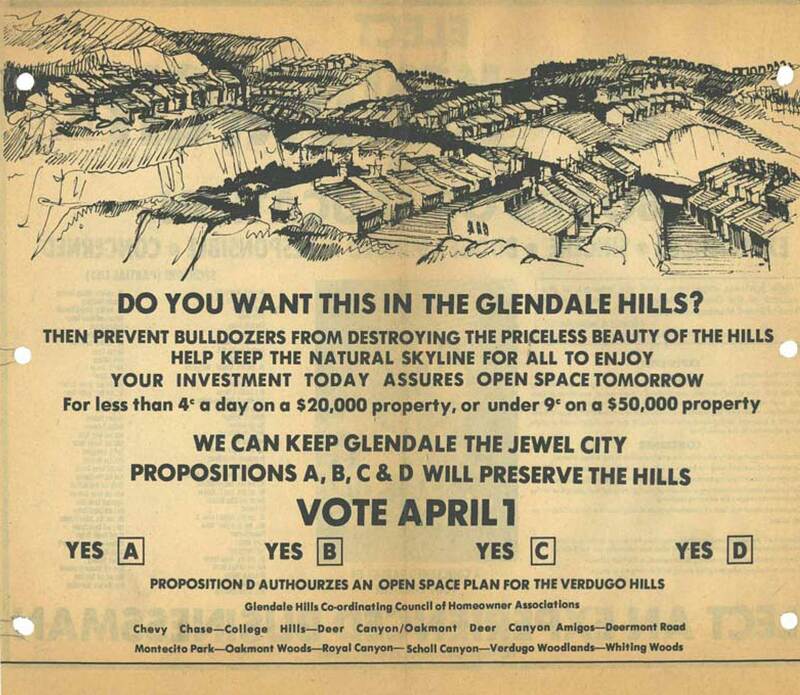 In 1971 the Glendale City Council passed a zoning ordinance that was to have considerable impact on the fight for orderly hillside development. This was the new ‘Planned Residential Development’ (or ‘PRD’) zone, which in certain circumstances permitted high-density hillside development involving the use of multiple clusters of ‘townhouse’ residences. In vain, the Chevy Chase Estates Association opposed this ordinance. One immediate effect of this was reactivation of the Hensler-MacDonald (H-M) project. Early in 1972 H-M sought a zone change from R1 to R2 on 304 acres they owned on the northwest slopes of the canyon, for the purpose of building 1654 townhouse dwelling units. The average size of the units would have been 970 square feet. This zoning change was approved by the Planning Commission. CCEA opposed this zone change, and obtained 923 signatures of property owners and members of the Association in opposition. But this only reflected opinion. CCEA also undertook the Herculean task of obtaining the signatures of all homeowners whose property was contiguous with that of the Hensler-MacDonald property to be rezoned. This feat mandated that the City Council had to pass the zoning change by a unanimous vote. Perhaps awed by this ‘display of displeasure,’ the City Council voted 3-2 against the zoning change. Just before Thanksgiving 1974, a new developer entered the picture – Baldwin, a name that was to become very familiar to many residents. The Baldwin Company of Irvine sought permission to build a ‘Planned Residential Development’ of 209 townhouses on 63 acres of land on Linda Vista opposite Figueroa. This development, to be called ‘The Sycamores,’ would involve ‘cut and fill’ operations involving over a million cubic yards of dirt over a three-year period. Baldwin also proposed to extend Figueroa through to Glenoaks, a distance of about 1,000 feet. Once again CCEA scheduled public protest meetings, urged residents to ‘pack the halls’ at hearings, and generally demonstrated their strong opposition to this project. The PRD ordinance was badly flawed, and in mid-1975 the Planning Commission sent the ordinance back to the City Council, saying it was unworkable. In the meantime, CCEA had been cooperating with other city and hillside groups in support of an initiative petition calling for outright repeal or substantial change of the PRD ordinance. Faced with this opposition, the City Council voted to repeal the existing PRD ordinance. With community-wide input, a new PRD ordinance was drafted, debated, and finally approved. In 1978 Baldwin again applied for City permission to build the Sycamores development, now on 155 acres (in addition to the 63 acres that Baldwin owned, they had obtained an option on 92 adjacent acres extending down from their property). Faced once again with CCEA opposition, Baldwin sought the Association’s cooperation with several compromises. First, he would build only 130 houses on just the upper tract. Second, he would accept certain measures requested by CCEA that would effectively landlock the lower tract of property, precluding its development at any future date. Third he would follow the wishes of CCEA regarding extension of Figueroa to Glenoaks – subject to the desires of the City in this matter. In a controversial, split decision that still rankles many canyon residents, the Board of Directors voted to accept this compromise but not to endorse the Figueroa extension. Residents of Scholl (Glenoaks) Canyon were vigorously opposed to the extension, fearing it would increase traffic on Glenoaks. Baldwin then withdrew his request to build on the lower tract, and the City Council granted permission to proceed, and on January 2, 1980, Baldwin began work on the upper tract. Then followed months of grading and filling to transform the wild canyonside into flat homesites. 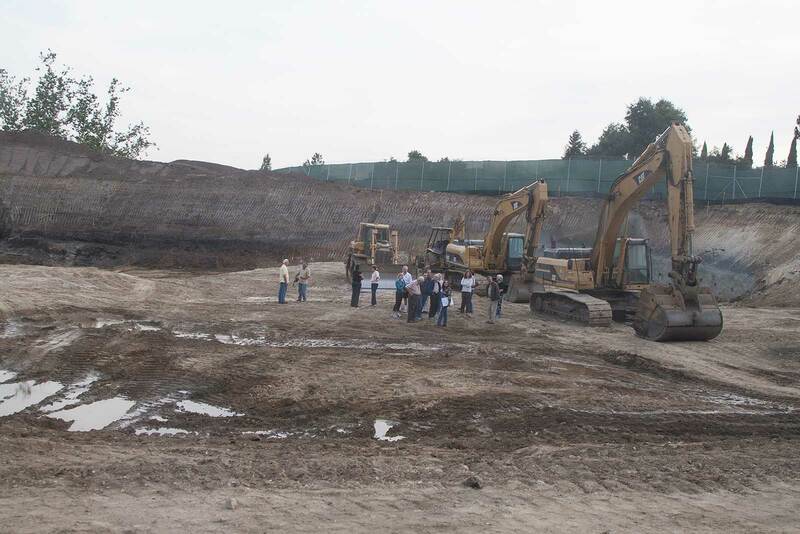 Some say the grading was done too early, for in the next rainy season considerable dirt eroded from the site and filled the nearby debris basin. The Association took the problem to the City Council, and Baldwin Company was forced to pay $28,000 to empty the debris basin. Finally, four large model homes were built along Linda Vista, while the remaining homesites lay undeveloped and became more and more eroded with each rainstorm. Sales ranged from few to nil, due to the high interest rates prevailing at that time, among other factors. By late 1982, the division of the Baldwin Company handling the Sycamores development had declared bankruptcy, and Crocker Bank took reluctant possession. Undeterred by one failure, the Baldwin Company took an option on the Hensler-MacDonald property in early 1983 and proposed to build 378 townhouses near the College and 414 single-family residences on the remainder of the property, extending from Cascadia in the lower canyon, past Sheridan Road, and up nearly to Emerald Isle. New access roads would be on Cascadia, Thurlene, and Emerald Isle Drive. That portion of tract devoted to the townhouses would require a zone change approved by at least a 4-1 vote. And, again, if all of the property owners whose property was contiguous to the tract objected, a unanimous vote of the City Council would be required to approve the zone change. 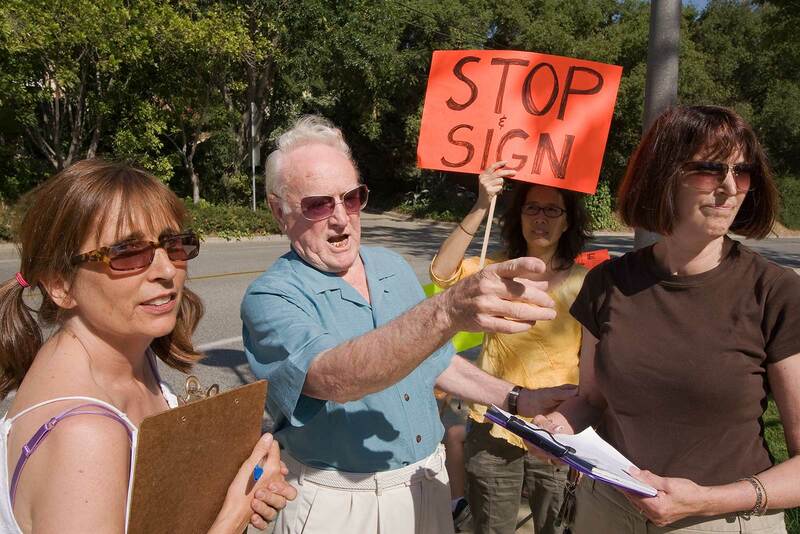 Once again, CCEA volunteers began seeking petitions and, with considerable help from homeowners in the Verdugo Highlands and Chevy Oaks areas, all necessary signatures were obtained. Before the City Council could act, the Baldwin Company came up with ‘Alternative II,’ a more dense development of single homes, duplexes, and townhouse units that was concentrated in the area between City College and Cascadia. CCEA objected to this plan because of drainage problems and the accesses through Cascadia, Belleau, and Emerald Isle. In late 1984, Baldwin proposed ‘Alternative III,’ which overcame most of these objections. This high-density development would be even more concentrated in the west-facing valley near Mountain Street and the Glendale Freeway, and would not be visible to Chevy Chase Canyon residents. Grading and filling would be minimal, and there would be no access on Cascadia or Belleau. Finally, the unused open space would be deeded to the City of Glendale to remain undeveloped. Another controversial issue was the extension of Mountain Street over the ridgeline to connect with Camino San Rafael at the top of Emerald Isle Drive, which was insisted on by the City Planning Department and many canyon residents. But while City officials were evaluating this third alternative, the Baldwin Company withdrew their option. In early 1985 the property reverted back to the Hensler-MacDonald interests. The prolonged 20-year-history of the various Hensler-MacDonald tracts is in sharp contrast to the rapid rise and fall of the ‘Goldrich Kest’ development. In early 1981, Goldrich, Kest and Associates of Anaheim proposed to build 191 single-family houses on 215 acres, encompassing almost all of the southeast slope of the canyon below the ridgeline from Glenoaks nearly to Linda Vista. There would be three access points from Chevy Chase Drive to the tract, via Laird Drive, Trammel Road, and St. Gregory Road, with another access from Glenoaks. The developer conceded that there would be “some modification of a major ridgeline and significant alteration of two secondary ridgelines.” What this meant is that a large ‘V’ cut would be made in the major ridgeline, and that the two smaller ridgelines would be obliterated to fill and level two canyons. 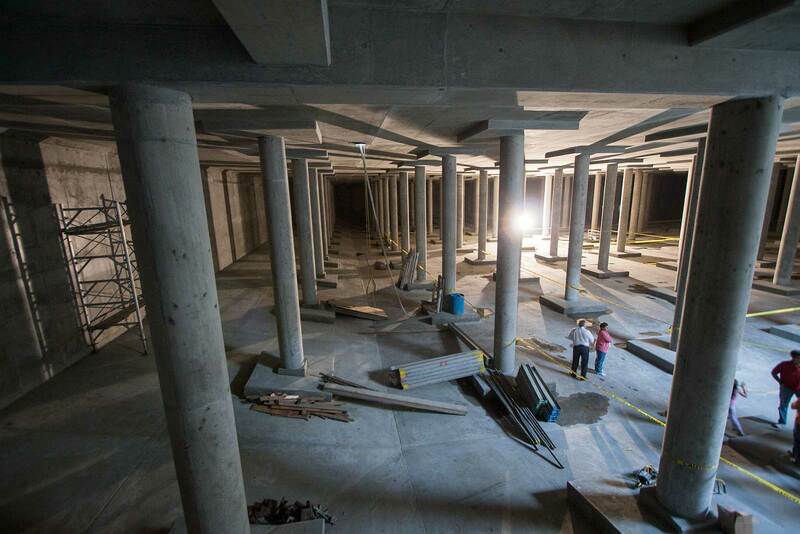 This would require moving 2,000,000 cubic yards of dirt. The Chevy Chase Estates Association strongly objected to this development, because of the massive amounts of earth that had to be moved, because of the loss of vegetative cover, and because the steep slope (67%) that would result in some areas would not allow much rainfall to percolate into the ground, and the result would be mudslide threats to all homes along the east side of Chevy Chase. A public hearing was to be held on June 25, 1981, and CCEA urged all homeowners to attend and express their views. But at the meeting, Goldrich Kest advised that it had ‘lost ownership’ of 13 crucial lots necessary for access to the tract. The City Council then voted unanimously to withdraw consideration of development of this tract. To quote from the News-Press, “The decision brought heavy applause from a jam-packed audience, many who had come to voice disapproval of the proposed project at the scheduled hearing.” Goldrich, Kest and Associates never applied for another hearing. Those 215 acres of land, now called the ‘San Rafael Ridgeline Property,’ still remain pristine open land, but they also represent a large chunk of ‘close in’ property that will continue to entice developers. The only permanent way to protect that land is to purchase it from the owners and deed it to the City to be preserved forever as open space. But this takes time, money, and commitment by the Chevy Chase Estates Association as well as by individual canyon residents. The next time Chevy Chase Canyon dwellers are asked to support the Association or to become involved in some way with the San Rafael Ridgeline Property, they should just think of what almost happened with the Goldrich Kest development. Hidden in a canyon between St. Andrews Drive and Chevy Chase Drive is Stuart Walk, a former bridle trail that is now a public walkway. Water flows nearby, supporting many live oak trees and ferns. Stuart Walk is little used because of its steepness, and in fact, it is difficult to find. Stuart Walk: Although obscure, the City Council voted in 1978 to preserve it from development. The City Council unanimously accepted this recommendation. Stuart Walk is still obscure today, but at least it doesn’t have three houses on it. 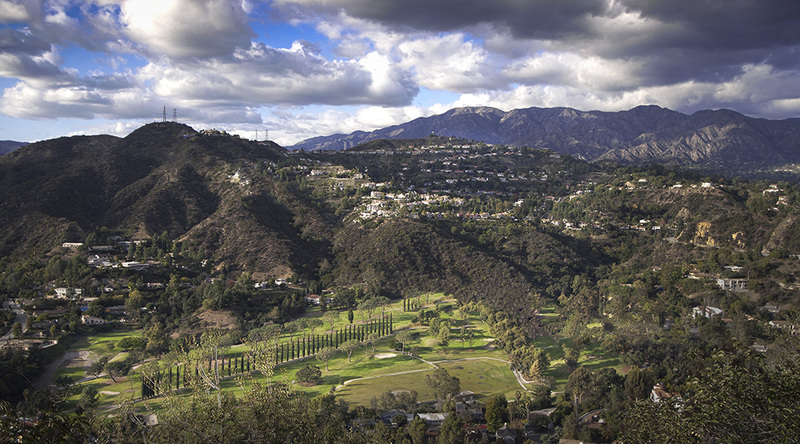 When Hensler-MacDonald re-assumed control of their property between the Chevy Chase and Verdugo Canyons, they continued to pursue the ‘Alternative III’ proposal of 140 townhomes, 312 duplexes (officially ‘paired housing’) and 136 single-family residences. Again this proposal was generally acceptable to the Chevy Chase Estates Association, as along as there was some assurance that the 230 acres of open space to be deeded to the city would forever be free from the threat of future development. However, opinion was divided on the City-mandated extension of Mountain Street through the development to Emerald Isle Drive. The City had long wanted an entrance into Chevy Chase Canyon from the west, preferably connecting with Emerald Isle Drive. The Directors of CCEA conducted a postcard poll of all canyon residents as to whether they favored or opposed such a road. While there was considerable variation, the upper canyon residents generally opposed the road (they liked their isolation, and felt the road would facilitate burglaries and be a fire hazard), while most of the lower canyon residents favored the road (believing it would help reduce the excessive traffic on Chevy Chase Drive). Residents were dismayed when, in early 1985, the City Planning Department had made yet another proposal for this project – single-family homes built across the entire length of the project, from the Mountain Street entrance to Emerald Isle Drive, with an access road at Bouquet and with no open space. Fortunately, after sensing the strong opposition from the Association and individual residents, the developer never pursued this proposal. Hensler-MacDonald’s Alternative III faced an interesting paradox. The City Council had voted 3-2 in favor of this development plan. However, the zoning change necessary for the development required at least a 4-1 vote, and only three members of the City Council favored the zoning change. Here too the stumbling block was the Mountain Street extension to Emerald Isle Drive. Then, in April 1986, a compromise was reached, the zoning change was passed, and permission was given to build the largest housing development in Glendale history. Hensler-MacDonald then spent several months evaluating the cost of the project and seeking development partners to aid in financing the project. Start-up costs were high: Hensler-MacDonald had to pay more than a million dollars to Glendale City College for a crucial bit of access land that the College owned. Finally, in early 1987, Polygon Homes of Costa Mesa purchased the Hensler interests. The new ‘Polygon-MacDonald’ company is now seeking approval from the City for some further changes in the plans, but soon will begin the grading, build the road, and construct the residences. Meanwhile, the Sycamores project at Linda Vista and Figueroa stood bare and neglected for nearly two years, the four model homes increasingly subjected to acts of vandalism, while Crocker Bank desperately tried to get rid of their ‘white elephant.’ Finally, Ponderosa Homes assumed management of the development on April 1, 1985 and construction of the new homes began immediately, as well as long-needed landscaping. Soon this barren and eroded scar of land visible from much of the upper canyon will be transformed into an area of homes, lawns, and trees. In September 1947, just as the Chevy Chase Estates Association was reorganizing after World War II, Mrs. Ruby Barnett (wife of long-time Association president Dr. Kelso Grant Barnett) organized a group of women living in the canyon to form the Chevy Chase Estates Garden Club. The Garden Club began with just coffee and doughnut gatherings once a month, but soon proceeded to monthly brunches, and then to monthly luncheons at nearby restaurants with a program topic relevant to those living in Chevy Chase Canyon. These meetings are held on the third Tuesday of each month, from October through June. To provide an agency for, and to present scholarship awards to graduates of Glendale high schools majoring in architecture, landscape architecture, botany, entomology, forestry, or allied fields and aiming to further their education along these lines in schools of higher learning. 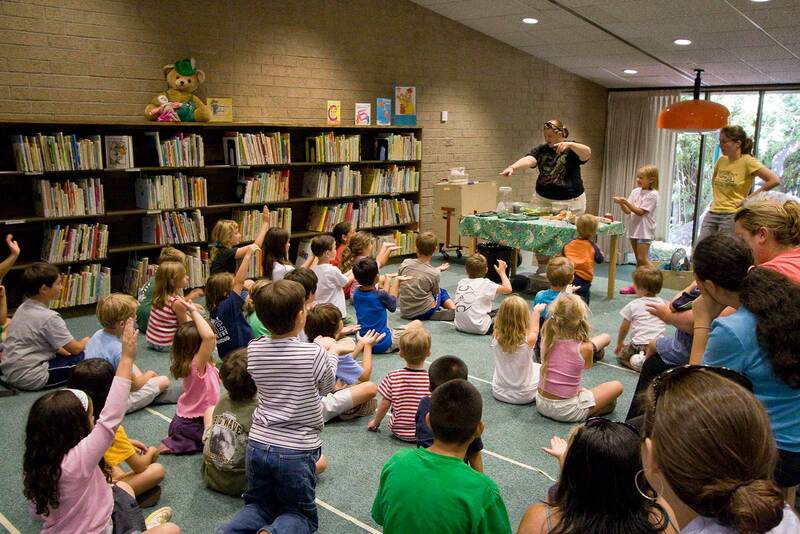 Over the years, the Garden Club has sponsored many canyon-wide activities. These included a Christmas party every year at the Chevy Chase Country Club for all the children in the area, social get-togethers for the canyon teenagers, Christmas open houses, poolside and patio parties, fashion shows, and progressive dinners. One activity that was too successful was “The Night Before Christmas” project, when virtually all homes on Chevy Chase Drive and many adjacent streets were colorfully decorated and ablaze with multi-colored lights. People came from all over the Los Angeles area to see the brilliant displays of color – and Chevy Chase Drive was clogged with cars all evening. Because the dense traffic could obstruct emergency vehicles, this traditional event was discontinued. In 1957 a scholarship fund was started to provide money to deserving students. At the present time the Garden Club provides scholarships to two students, a young man studying architecture and a young woman studying landscape design. 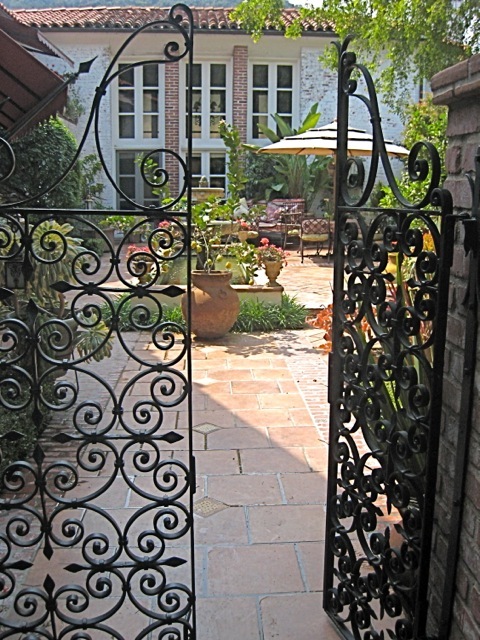 The Garden Club is perhaps best known for the construction and maintenance of the ‘Chevy Chase Estates’ portals at the base of the canyon. Each Christmas, the Club’s Decor Chairman decorates the portals with a different Christmas theme. A member of the California Garden Clubs, Inc., the Chevy Chase Estates Garden Club participates in various activities at the Los Angeles County Arboretum in Arcadia. The Club also makes an annual donation to plant seedlings in the Angeles Crest area, and each Arbor day it has trees planted, in the canyon area if possible, in honor or memory of Club members. In 1974 the Garden Club and Glendale’s sister city of Higashiosaka, Japan donated money to have the Tea House built in Brand Park. The Club also donated funds to help refurbish the Doctors House in Brand park. The ‘Ruby Barnett Award’ is presented each June to the member whose garden best characterizes the spirit of the Chevy Chase Estates Garden Club. The September meeting is usually held at her home. The Club’s annual Christmas Party is also held at a member’s home. Each month the Club awards to a lucky member two tickets to attend a Glendale Symphony concert at the (??????) Dorothy Chandler Pavilion. All people living in the canyon are invited to join the Chevy Chase Estates Garden Club and to share in their activities. They will meet new friends, learn skills of interest, and enjoy themselves. Members of the Garden Club don’t have to have an interest in gardening, since the Club is more of a social group. Yet, those attending the meetings and other activities are sure to develop an appreciation of gardening, landscaping, and interior decoration. Information about the Chevy Chase Estates Garden Club may be obtained from the president, Kathy Samuel, 3144 Buckingham Road, Glendale, California 91206, Telephone 244-1255. 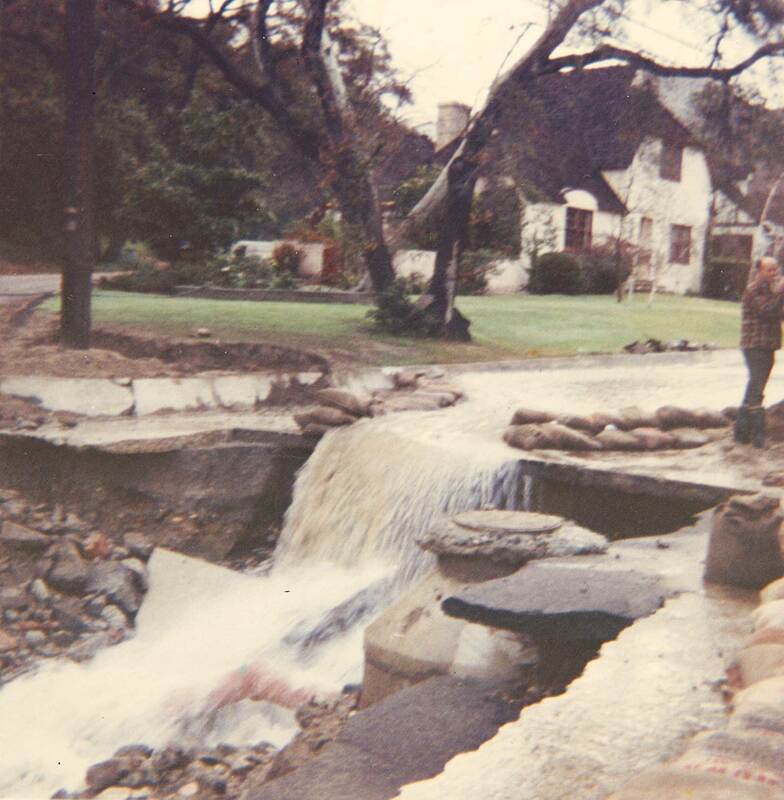 The original ‘Chevy Chase Portals’ in the lower canyon, a project of the Chevy Chase Estates Garden Club, were badly damaged during the construction of the flood control channels in 1969. Rather than try to repair them, the Garden Club asked architect Howard Van Heuklyn, a canyon resident and long-time Director of the Association, to draw up plans for new portals, which he did. The new portals were constructed at a cost of $2,000 with funds raised by the Garden Club. The Club also maintains the lights in the portals, and provides the Christmas decorations that festoon them each year. In 1970, responding to canyon concerns about fire hazards and the distance of the nearest fire station, the City sought bids for a new fire station in the canyon and, as an added surprise, a branch library. The site chosen was on land owned but unused by the Chevy Chase Country Club. The winning design was submitted by Howard B. Van Heuklyn. The $2,000,000 structure was opened on May 24, 1972. The original 1925 plans for Chevy Chase Estates included four developed parks and playgrounds within the community, but these disappeared with the passage of time. 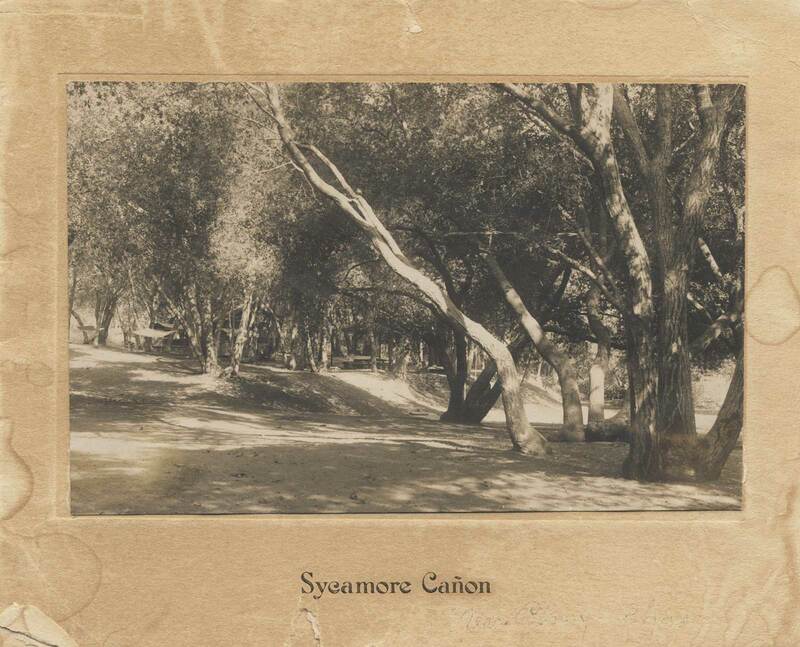 By 1970, residents and the CCEA were urging that the City establish a city-maintained park in the canyon. In 1973, on request of the Association, the Glendale Board of Education authorized the development of an 11 acre unused school site as a recreation area, and plans were drawn for a children’s play area with minimal playground equipment on the front part of the parcel, with a small baseball diamond and backstop on the balance of the property. Alas, the City was unable to provide funds to construct or maintain the planned park. In 1975, Carlton Builders (who developed most of the Emerald Isle area) purchased the land from the Board of Education. They built 14 homes on Lenore street, and dedicated three acres for park purposes, and the City agreed to maintain it. Although it is small and remote, the canyon now has Emerald Isle Park in its midst. As a result of traffic complaints made at the 1985 annual meeting of the Association and heard by invited City officials, the full length of Chevy Chase Drive, within the canyon, was provided with a double yellow (no passing) line and reflectors. The excessive speed of cars on Chevy Chase Drive was also a major topic at that meeting, and the Association was urged to recommend to the City Council that the posted speed limit be reduced from 35 to 25 miles per hour. Many residents favored such a move, but many others opposed the reduction of the speed limit. Because of these differences, the Association felt it could not take a stance. However, an enterprising group of lower canyon residents gathered an impressive number of signatures on a petition and presented it to the City Council. After reviewing the situation and hearing the petitioners’ complaints regarding the hazards of backing their cars out of their garages into speeding traffic, the City Council lowered the speed limit to 25 miles per hour. Gold and silver were mined in Sicomoro Canyon in the l9th century, with the ore reputedly packed out on mules to Pasadena and sent by wagon train to the smelter in Los Angeles. 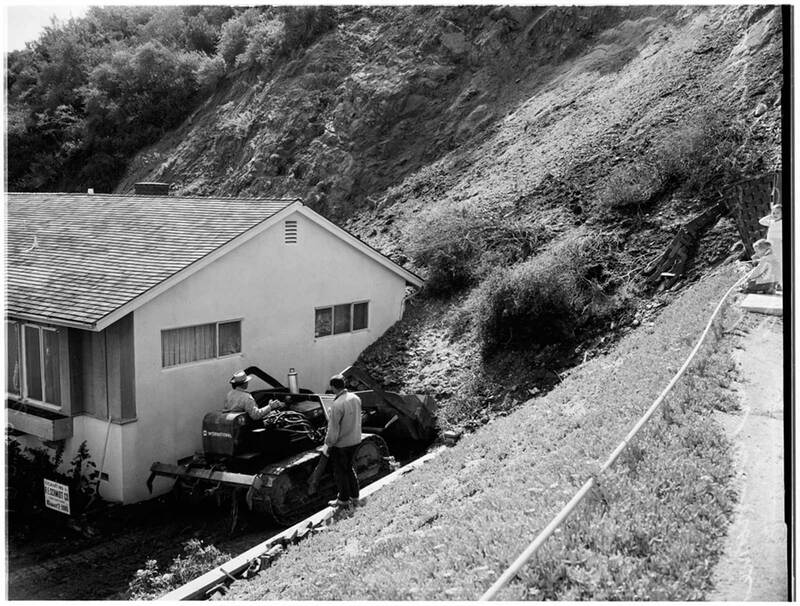 In 1964 a local resident found the opening to a mine, between Figueroa and the branch library, which extended about 300 feet into the hillside. Because of its possible danger, the Fire Department sealed the opening to the mine. The last bear in the canyon was shot in 1906. This has been a history of places and events, not of people. Yet, no history would be complete without paying tribute to two people whose names will be forever linked with the activities of the Chevy Chase Estates Association, and subsequently, with the canyon in general. Sylvia D. Moody . . . Mrs. Moody served as secretary-treasurer of the Association from its organization in 1937 until 1981. It was she who climbed over the hills and up the primitive sidestreets in 1937 to collect signatures on the first petition opposing the subdivision of the golf course. She took extensive minutes of all Association meetings and saved news-paper clippings of all canyon-related events, from Planning Commission hearings to fires and floods (and those archives form the basis of this book). She continued to pack petition after petition around for residents to sign, she spoke up at the City Council hearings, she badgered friends and neighbors for funds when funds were desperately needed. Without Mrs. Moody as an early canyon resident, Chevy Chase Canyon would be a far less desirable place to live. Kelso Grant Barnett . . . A former chairman of the Gendale Planning Commission, Dr. Barnett served for 20 years as President of the Chevy Chase Estates Association and devoted untold hours to the benefit of all canyon residents. The period of his presidency, from 1947 to 1967, spanned the crucial years when the golf course was under almost constant attack by developers who saw it only as a place to build houses and when other developers saw green hillsides that they felt should be covered with condominiums. Yet, he always maintained friendly relations with City Council members, major department heads, and other policy-making officials. 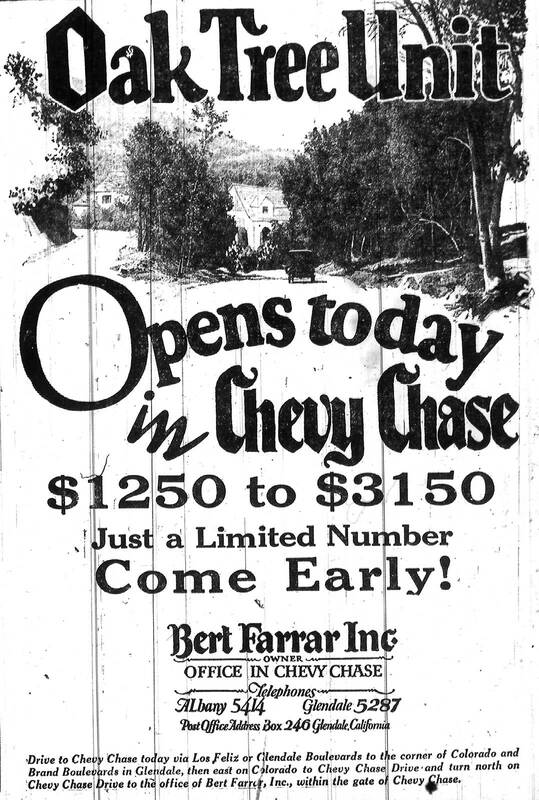 The Chevy Chase Canyon that we know today owes much to Kelso Barnett. The presidents of the Association (as well as the members of its Board of Directors) have all donated their time and talent to the affairs of the association, sacrificing hours that could be spent with their families and gaining no recompense except for the knowledge they have contributed something toward maintaining the quality of life that we have come to expect when living in Chevy Chase Canyon. They also merit a tribute. That is the spot we call Chevy Chase. 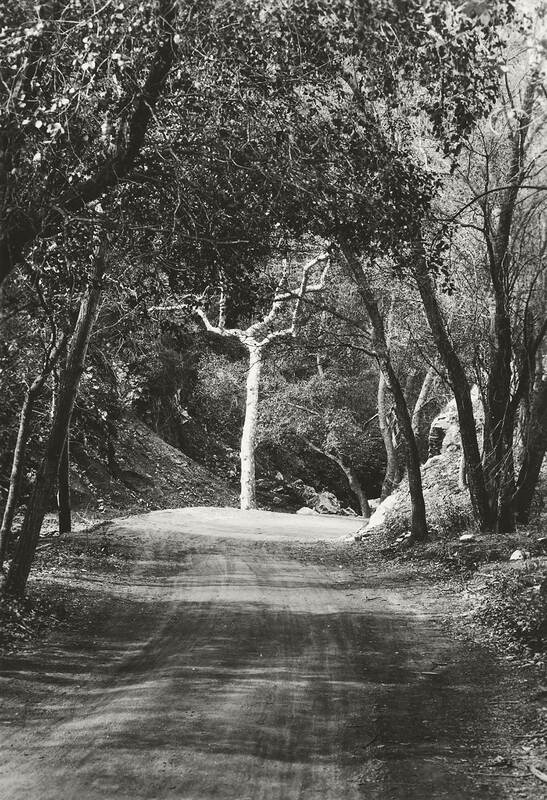 In the years since this history was first published, the Chevy Chase Estates Association has continued its mission to protect and preserve the natural beauty and quality of life of our treasured canyon. Battles to protect Chevy Chase Canyon have been won, lost, and at times ended in a draw only to be fought again. Rancho San Rafael – By the early 1990’s the massive Rancho San Rafael Project was finally built. Fought over for years in front of planning commissions and the City Council, strongly opposed by the CCEA, the objections and warnings concerning this project went unheeded. 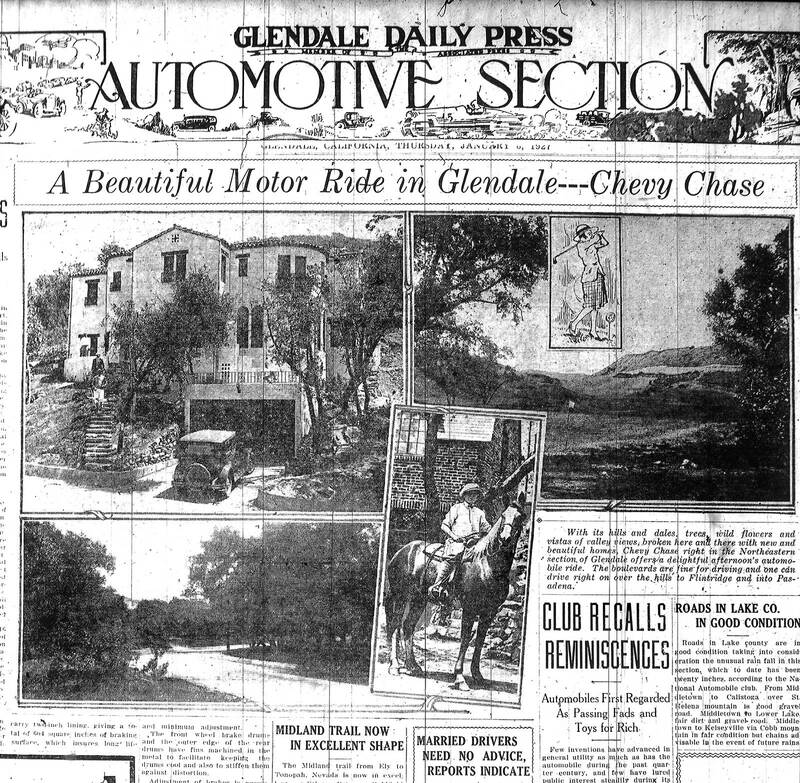 The largest development in the history of Glendale, with its bulldozing of hillsides and close-packed cookie-cutter homes, became a poster child for undesirable development. Rancho San Rafael also became the battle cry for those who sought to protect Glendale’s remaining natural hillsides via the implementation of a strong hillside ordinance that would regulate development. College Hills Fire – On June 27th, 1990, just west of Rancho San Rafael, a brush fire driven by hot dry 40 mph winds turned into a firestorm that destroyed 46 homes and damaged 20 others. Known as the College Hill Fire, it would later be discovered that the blaze was set by a disgraced former Glendale Fire Captain and arson investigator who was sentenced to life in prison for arson and murder. 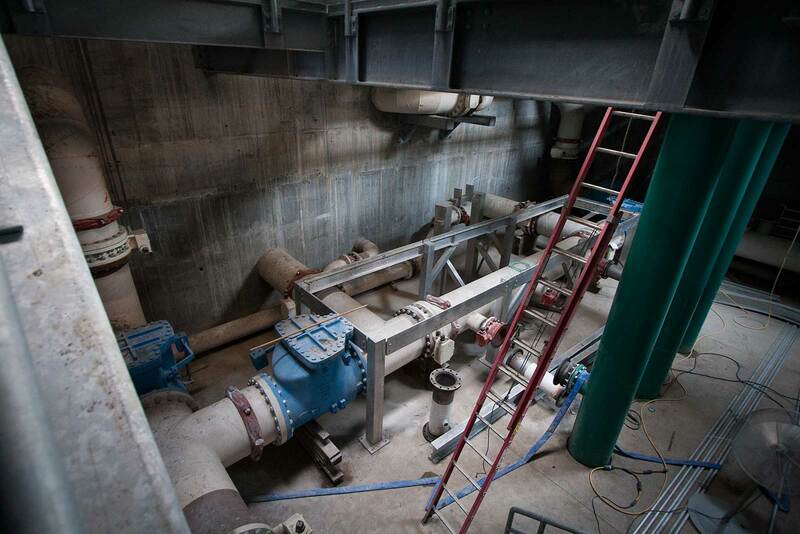 Changes and Upgrades – The canyon has also seen infrastructure changes and upgrades over the last 20 plus years. After numerous homeowner complaints and accidents, the speed limit on Chevy Chase was lowered from 35 mph, to 25. And then a few years later, the city inched it back up to 30. The speeders, reckless drivers, and auto accidents continued unabated. Emerald Isle Park had improvements to the grounds made in the late 1980’s. In the early 1990’s, Mountain Avenue was extended along Camino San Rafael all the way to Emerald Isle Drive. 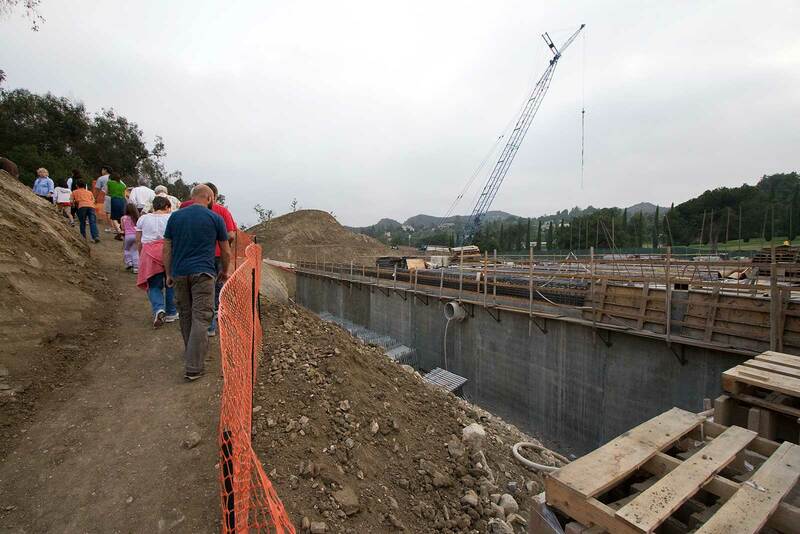 By far, the largest municipal project the canyon had seen in quite some time was undertaken in 2009 by Glendale Water and Power. 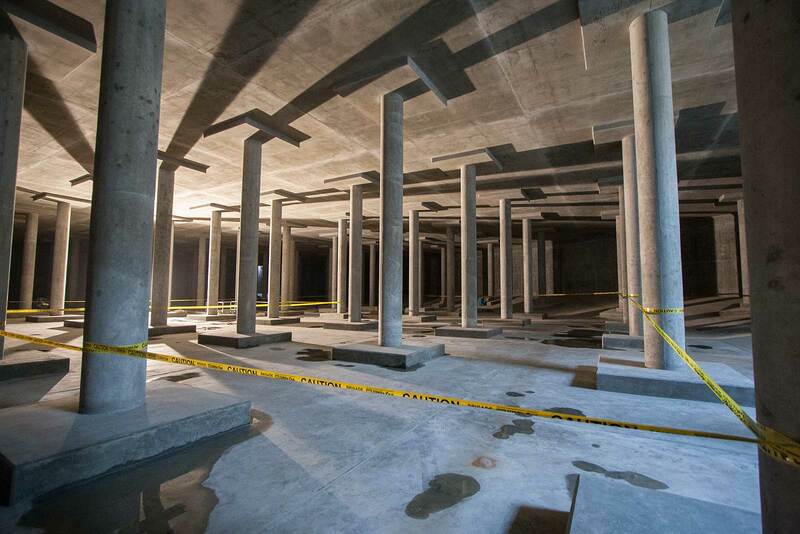 Replacements or relining of water mains across the canyon culminated with the demolition and rebuilding of the huge 1920’s reservoir located underneath part of the Chevy Chase Golf Course. 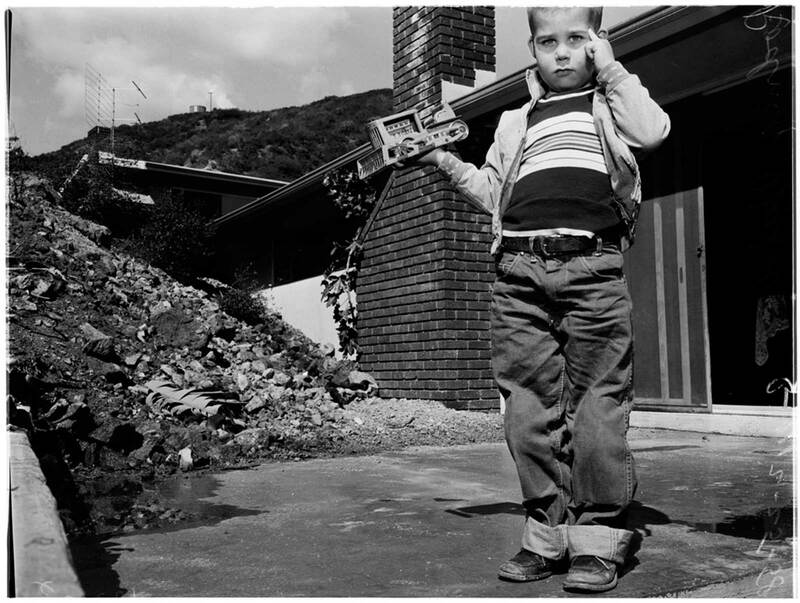 Birth of the Hillside Ordinance – Between 1992 and 1993, the CCEA and other Glendale homeowner groups spent a substantial amount of time and money negotiating with the city for a new hillside ordinance. 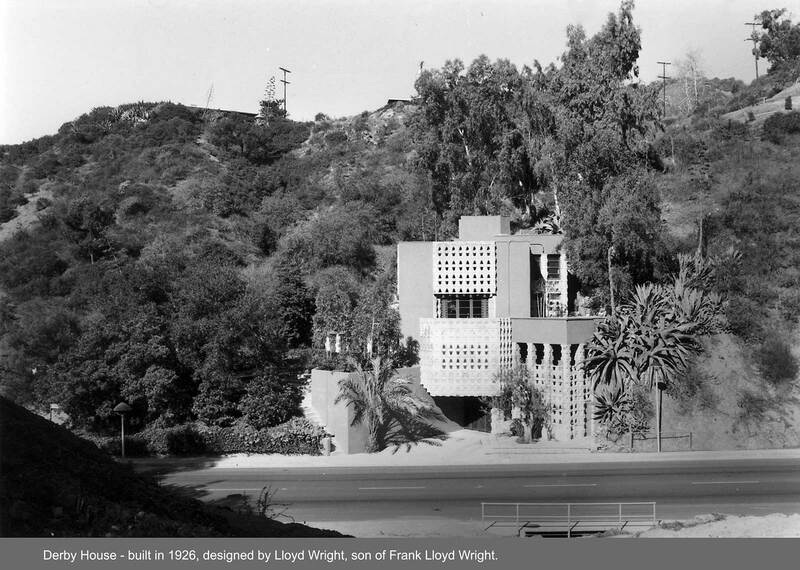 The CCEA engaged the firm of J.L.Webb Planning to create a study of the terrain and natural habitats of Chevy Chase Canyon. Submitted to the City Council, the CCEA’s report titled Hillside Development Program, offered critical guidance in crafting legislation. In 1993, City leaders recognized that the time had finally come to control the irresponsible development on the City’s hillsides. And so the Hillside Ordinance was born. The new law placed reasonable restrictions on developing small, steep slopes, and protected the ridgelines, which grace our views. With this new law on the books and a City Council dedicated to protecting our hills, all seemed right in our little part of the world. 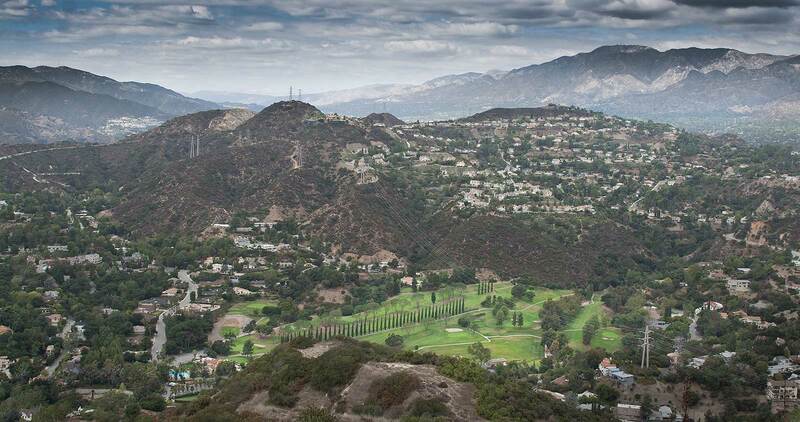 The fight to save our hillsides continued – Land booms of the 1990’s and 2000’s attracted unscrupulous developers, ready to develop lots, regardless of the fact that many of those lots were rendered “unbuildable” by the Hillside Ordinance. The developers started making friends at City Hall, and then flooded the City with requests for exceptions to the Hillside Ordinance. The CCEA and longtime homeowners petitioned and appealed again and again to the City Council to uphold the Hillside Ordinance. In a battle fought skirmish by skirmish, lot by lot, the Chevy Chase Estates Association prevailed at times, and lost at others lost. Although the CCEA called for a strengthened Hillside Ordinance, a constantly changing city council that bowed to the prevailing political winds of any given moment made the enforcement of stricter statutes, let alone existing laws, problematic. Country Club Fears – Fears for the future of Chevy Chase Country Club arose once again, this time in 1998 as the golf course property lease was set to expire in 1999. Although the land was zoned for “special recreational” purposes, many feared a new owner would seek a zoning change and attempt to develop the property. Rumors of high-tech condos and shopping malls in the Canyon worried many residents. 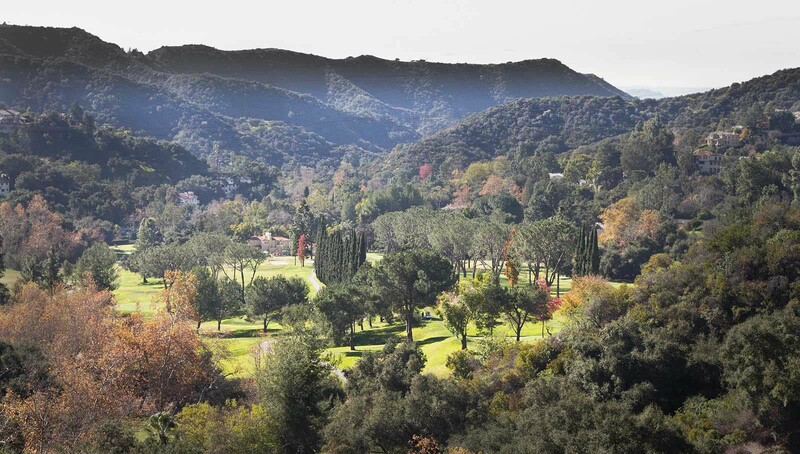 The future of the Country Club would have an enormous impact on quality of life in the Canyon, and affect residential home prices in the entire area. In the end, the land was purchased as a golf course, but the nagging question remained: Would new owners know how to make a go of it, would the country club survive and flourish? Wildfire – Canyon residents would not soon forget the fire in December 1999. As walls of flames stretched from La Cañada to Chevy Chase ridgelines, many rushed to pack up families and their most precious possessions as water-dropping helicopters and super scooper planes fought tirelessly to save entire neighborhoods. Thanks to what can only be described as a superhuman effort by the Glendale Fire and Police Departments, assisted by fire companies from every neighboring city and dozens of government agencies, disaster was averted and not one home was lost. Three platoons currently man the Chevy Chase Fire Station, providing round-the-clock protection and response for the Canyon. 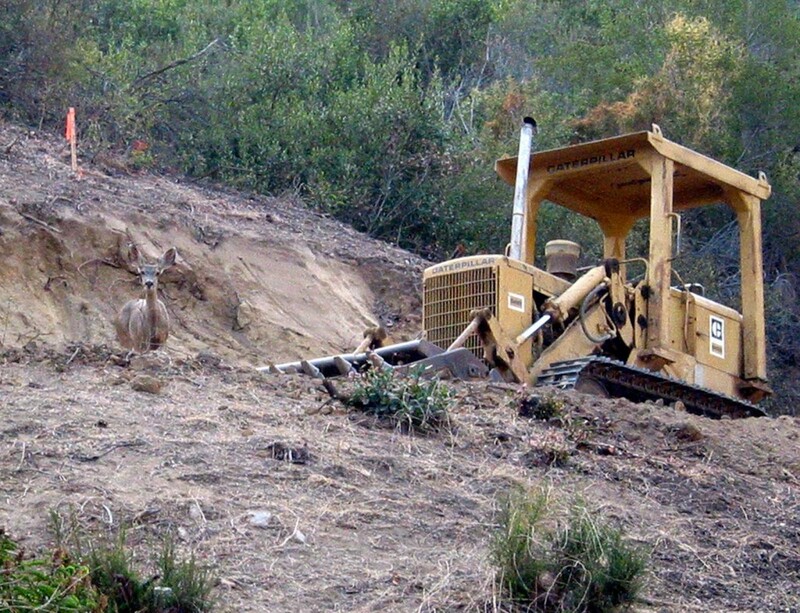 Day in Court – 2002, chalk it up to the cost of defending our hillsides. The City of Glendale and Chevy Chase Estates Association were sued by speculator-developers over the City Council’s denial of a Conditional Use Permit (CUP) for a vacant lot. Despite CCEA’s strong objections at the initial hearing, the Zoning Administrator granted a Conditional Use Permit (CUP) and a variance for the proposed construction. CCEA filed an appeal and ultimately, the City Council heard the case. On October 2, 2001, the granting of the CUP was reversed. The developers then filed an action in Los Angeles Superior Court requesting that the court order the City Council to change its ruling. In the end, the City of Glendale and the CCEA prevailed in both the Superior Court, and then later in the court of appeals. Wins and Losses – The CCEA’s fight to save the canyon’s hillsides saw a both a setback and a major victory in 2004. The City Council again voted on the Hillside Ordinance with amendments offered to strengthen the law, amendments strongly supported by the CCEA. Although some were adopted, the council by a four-to-one vote did not approve certain other key provisions. The City did, however, act to save large tracts of our open space. During one of the rare times when municipal coffers were full, the City Council approved the purchase of two large parcels of land in the Canyon. The first was the Murchison Tract, 148 acres astride the hilltop between Chevy Chase and Glenoaks Canyon. The second, the Poulsen Tract, was purchased when the owner of the steep, wooded 72-acre parcel, known as Flint Canyon, had submitted plans to develop up to 39 multi-million-dollar homes. The CCEA lobbied strongly for the City’s purchase of the land, and received enormous support in our efforts, particularly from V.O.I.C.E. (Volunteers Organized In Conserving the Environment), the Glendale Coordinating Council and many residents. CCEA Battles On – Defending and strengthening the Hillside Ordinance in conjunction with preserving and protecting our hillsides remained the most significant matters affecting the Canyon. Every new application for development submitted to the planning department was reviewed by the CCEA. If a particular development didn’t meet Hillside Ordinance guidelines, CCEA opposition was guaranteed. The battle to defend our hillsides against undesirable development was to move into the trenches of city planning commissions design review boards. 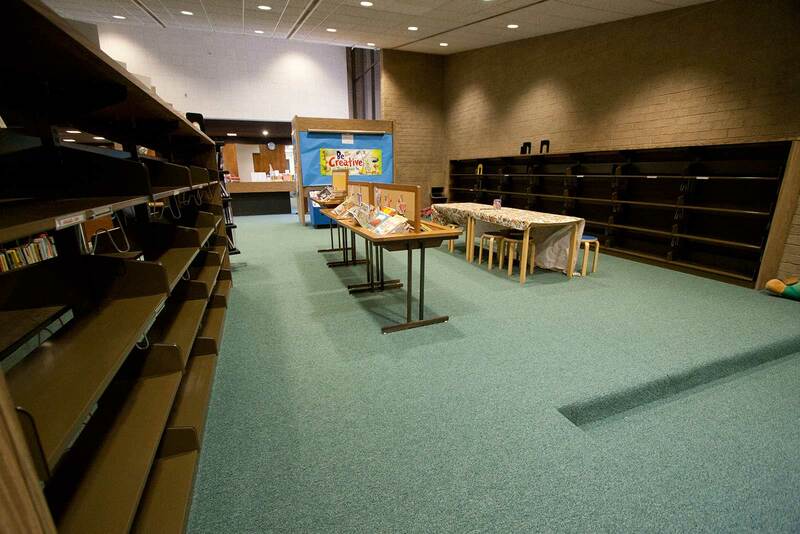 The Little Library that Could – Since its opening in 1972, the Chevy Chase Library has provided generations of families with books, computers, story-time readings for kids, and countless educational, cultural, and community events. 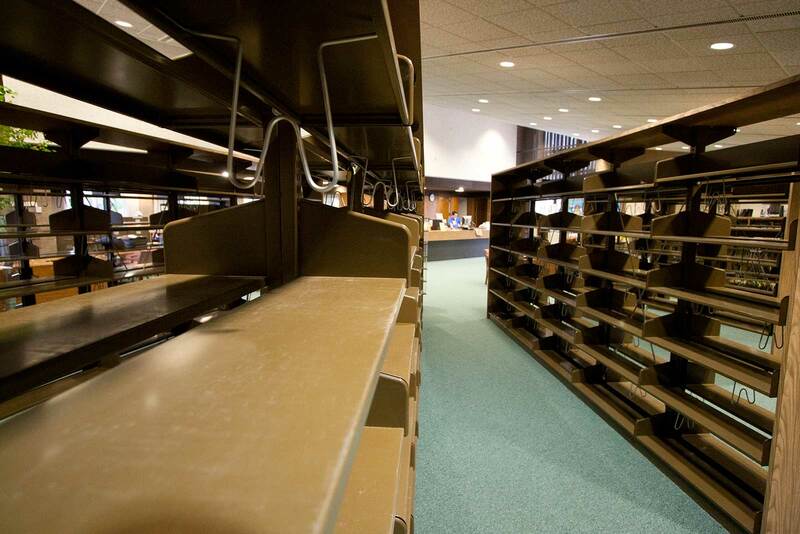 Throughout the years, our library branch has repeatedly faced numerous threats of closure, and has had its hours, staffing and programs reduced. 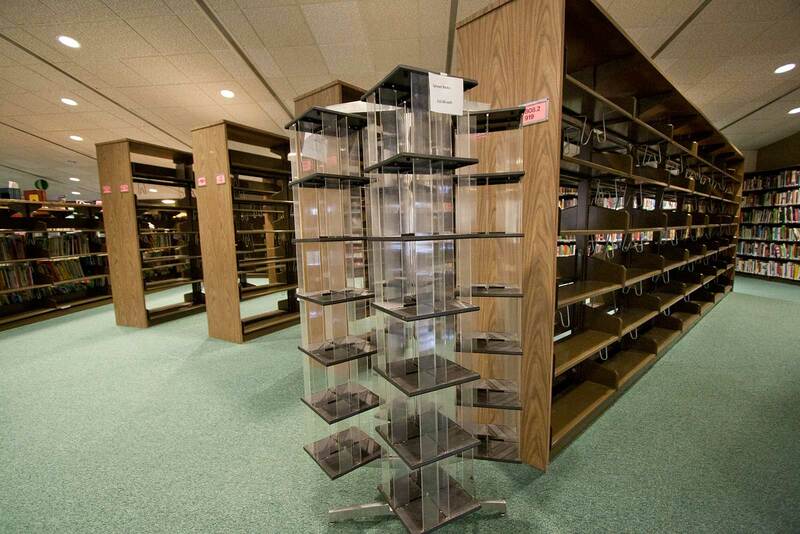 In 2011, facing a city wide budget shortfall and an annual expense of $22,000 to keep Chevy Chase open, the Library Director, after ordering the disposal of half its books and shelving, submitted a proposal to the City Council which effectively would have ended the library’s existence as a library. Spearheaded by the Chevy Chase Library Volunteers, a concerted effort to save the library was launched with the support of the Chevy Chase Estates Association board, CCEA members, and hundreds of local residents. 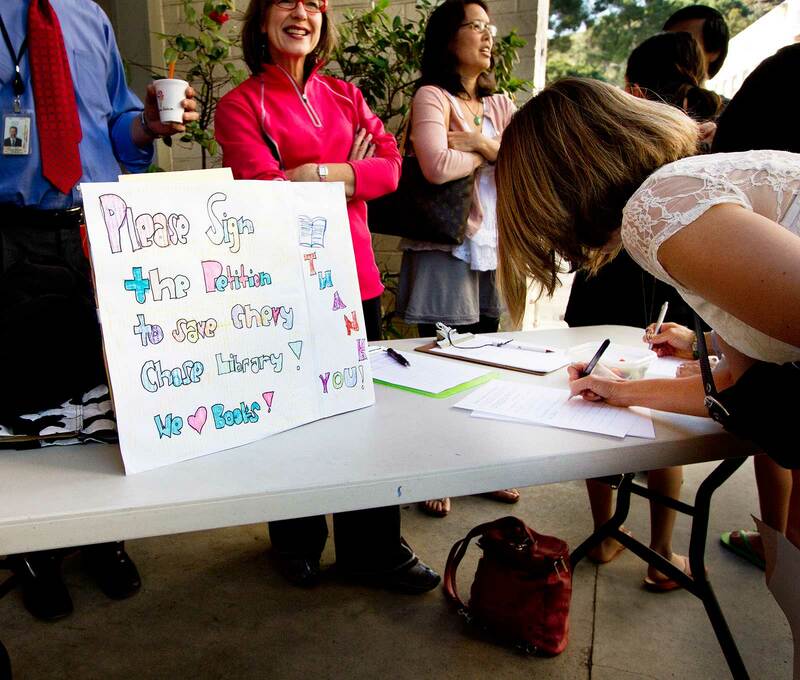 In just a few weeks, 469 petition signatures were collected, letters were sent to the Glendale News Press and City Council and 63 Glenoaks Elementary students wrote letters to the City Council. 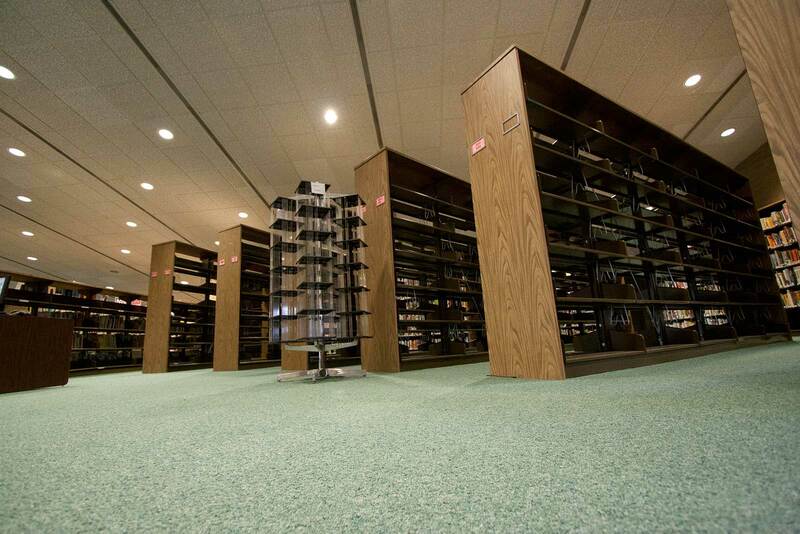 As a City Council member once observed, “Chevy Chase Canyon, they’re like a hive of bees, you don’t want to stir them up.” In the end, our library was saved. 75 Years – 2012 marked the 75th birthday of the Chevy Chase Estates Association. 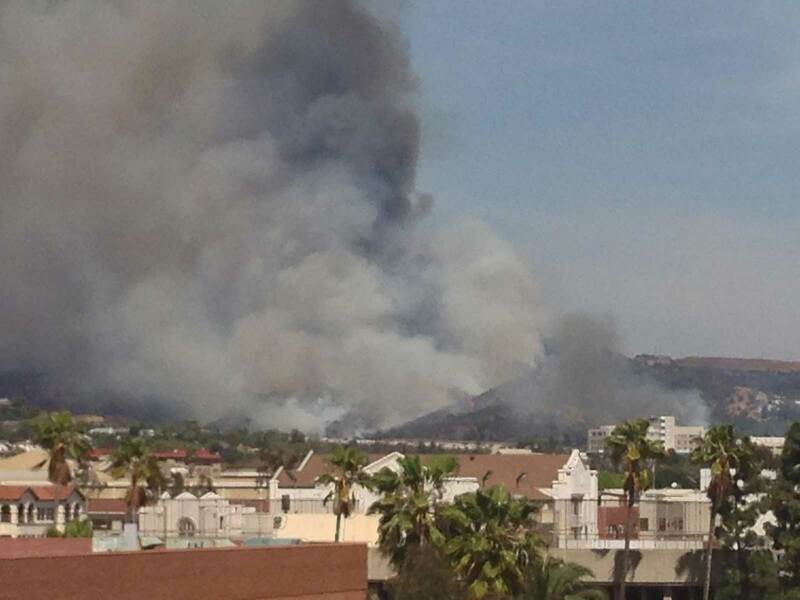 May 3, 2013 Wildfire! It started near the 2 and 134 freeway connection and raced east toward Chevy Chase. Police blocked access to the Canyon as scores of firefighters climbed our ridgelines to battle a brush fire that could have destroyed countless Canyon homes. Evacuation orders were issued; the Police Department closed all access to the Canyon and held dozens of anxious homeowners at barricades despite residents’ pleas that they be permitted to enter the Canyon to reach elderly family members and pets trapped in homes. 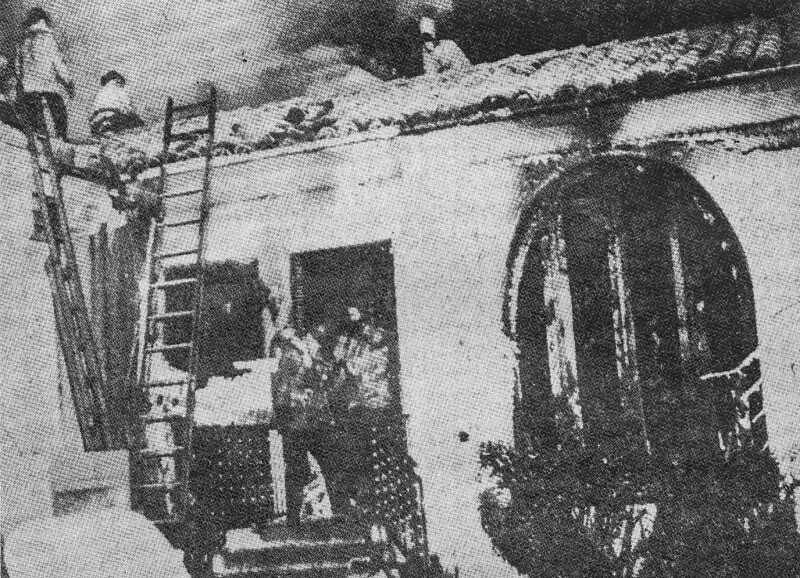 Although many of the same problems with emergency response coordination echoed exactly those that had surfaced in the conflagration of 1986, thanks to the heroic efforts of the Glendale Fire Department, during this fire no homes burned and no lives were lost. Country Club Redo – Promising to breathe life into a moribund Country Club and Golf Course, a team of new owners won City Council approval for a sweeping remodel and upgrade to the aging Chevy Chase Country Club Clubhouse. 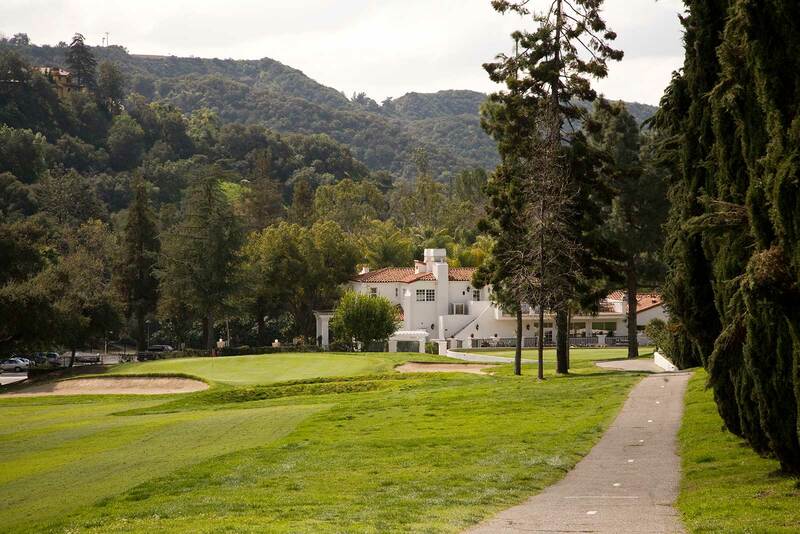 Given that improvements would help ensure the viability of a country club, as well as boost surrounding property values, the Chevy Chase Estates Association found itself in a novel position as it vigorously argued in favor of the project before city boards, commissions, and ultimately the Glendale City Council. Instead of its usual role of opposing development for being harmful to the Canyon, this was a project the CCEA strongly endorsed. Glendale Council Member Dave Weaver speaks about the CCEA, The History of the Chevy Chase Estates Association booklet, and the Chevy Chase Country Club. They Return – The first edition of this history featured a tag near the end that read, “The last bear in the Canyon was shot in 1906.” In this second edition, the closing canyon update is, the bears are back! Perhaps it was their loss of habitat from the Station Fire that blackened the San Gabriel Mountains, or simply the steady southward migration of bears in California, but in 2012 the bears returned to Chevy Chase. 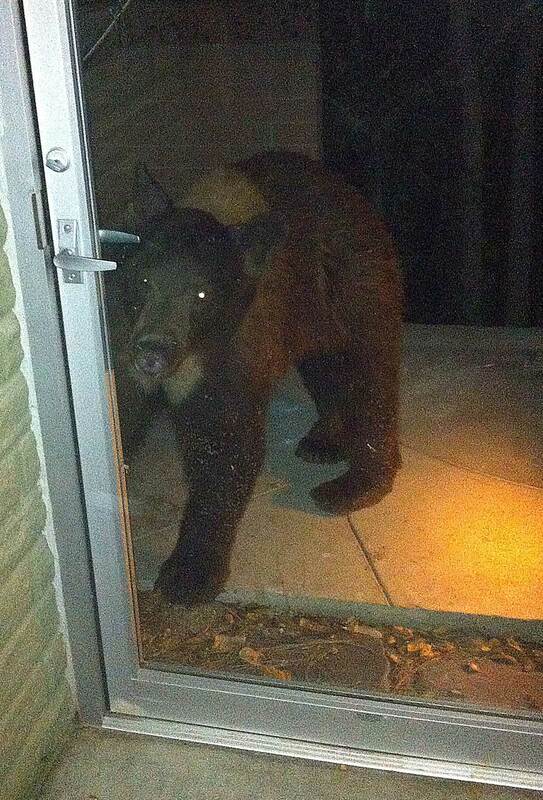 Bear at the door of a home on Cornwall Drive. Download the First Edition of the History of the Chevy Chase Estates Association, And the Community it Serves 1925-1987. An impressive body of work. Thanks for posting….I’ve enjoyed writing several Verdugo Views columns about Chevy Chase for the Glendale News-Press in recent years. Just read that that the house I grew up in, 1948-1968, was the first house built in Chevy Chase Estates. It was 2500, built on two lots. A multitude of oak trees provided the scene to play Cowboys & Indians, hike and indulge in Hide & Go Seek. The home was wonderful, full of Craftsman details, great hiding places, a spooky basement and great upstairs Windows. I enjoyed reading about the history of Chevy Chase Estates. I particularly enjoyed learning more about my great-grandfather, Dr. Kelso Barnett, and what appears to be the positive impact he had on your wonderful community. He must have done something right… he was President for 20 years! I’ve stopped by to see the old house on St. Andrews Drive and look forward to visiting again. Great website!